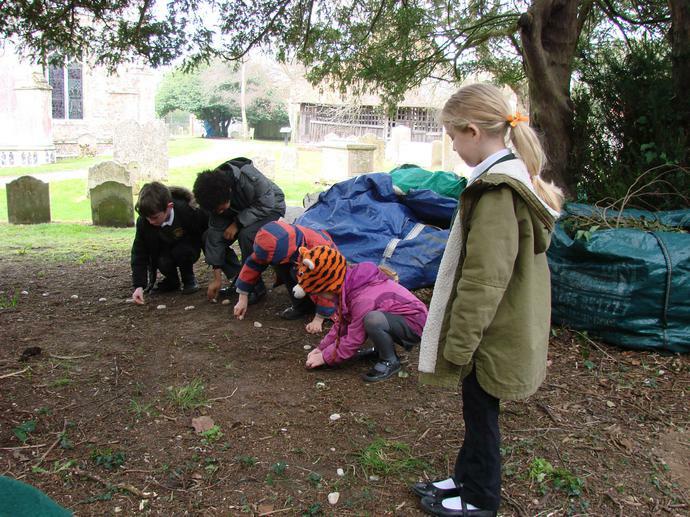 Yesterday the children worked in small groups to take part in a bone hunt! 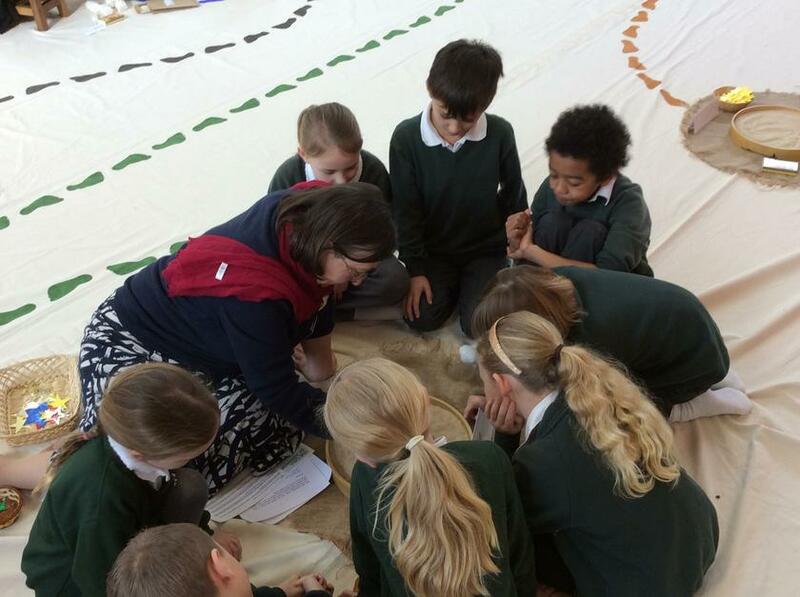 Diagrams of different bones in the body were hidden in various places around the classroom, and the children had to go around matching the diagram and scientific name to the bones in the skeleton they had on their tables. 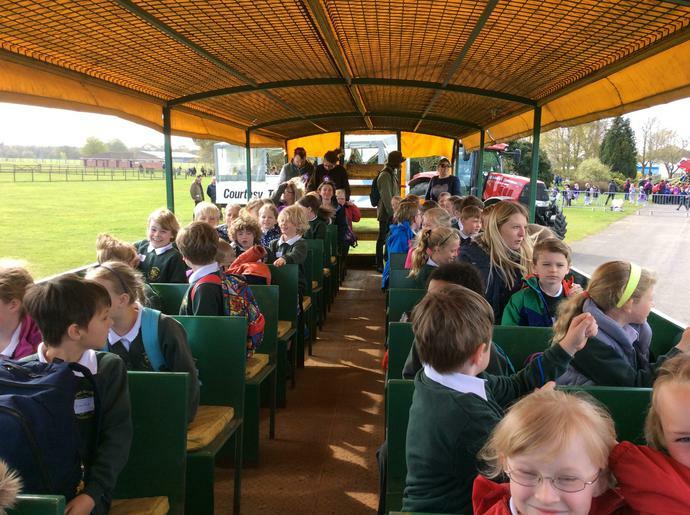 Today Year 3 and 4 hopped on the coach to visit the School Farm and Country Fair at Trinity Park in Ipswich. 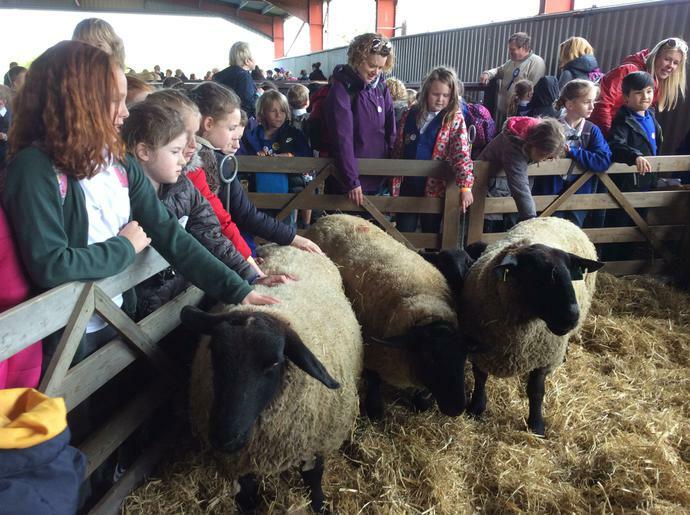 Throughout the day the children took part in a range of hands-on activities, designed to give them a greater understanding of local farming, food production and the countryside around them. 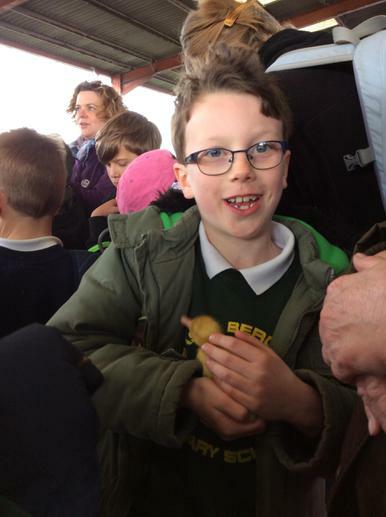 During the day we had a tractor ride, watched a sheep shearing demonstration and held some new born chicks! 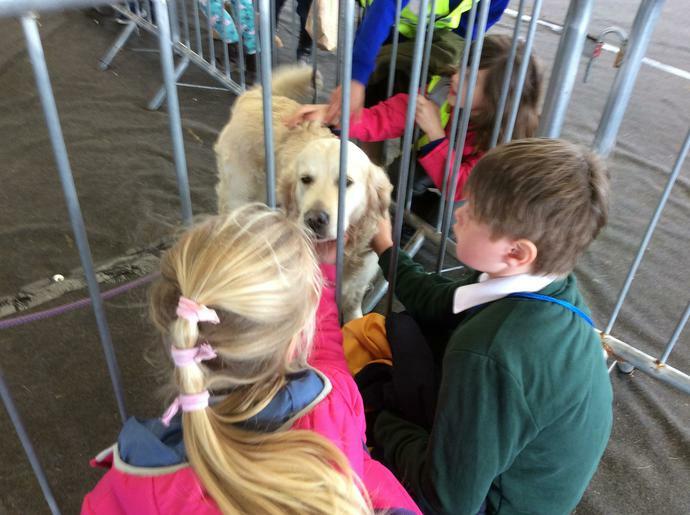 A big thank you to all the parent helpers who came along to support, as always it is much appreciated. 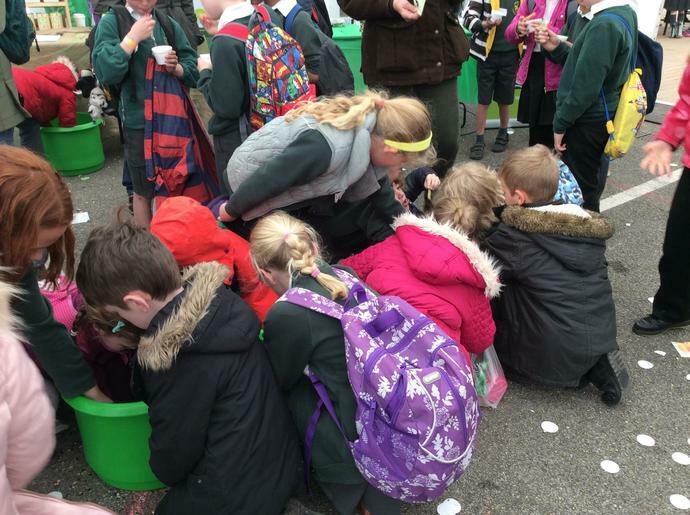 Take a look at the photos below to see more of the activities we got stuck in to. 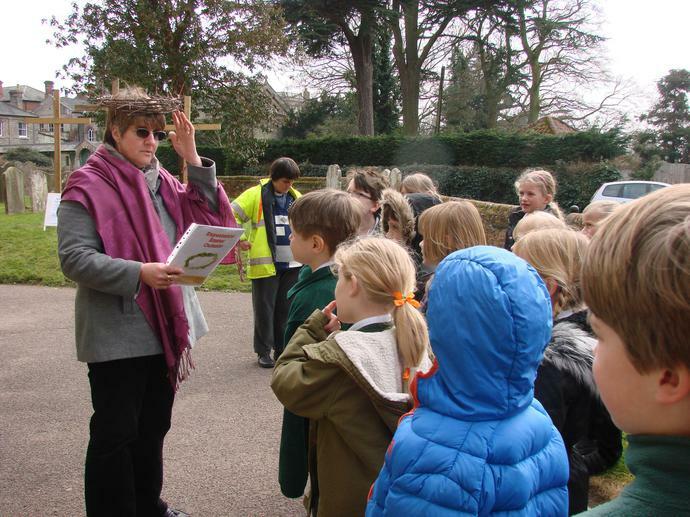 Last Wednesday the children were sent on a special hunt around the school. 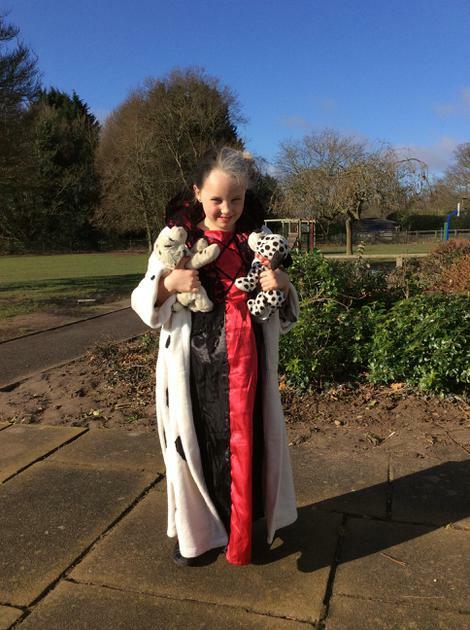 Mrs Baker and I had hidden a range of different fronted adverbials (inside and out) for the children to find. In pairs, they had to look for all 16, writing sentences using these as they went. 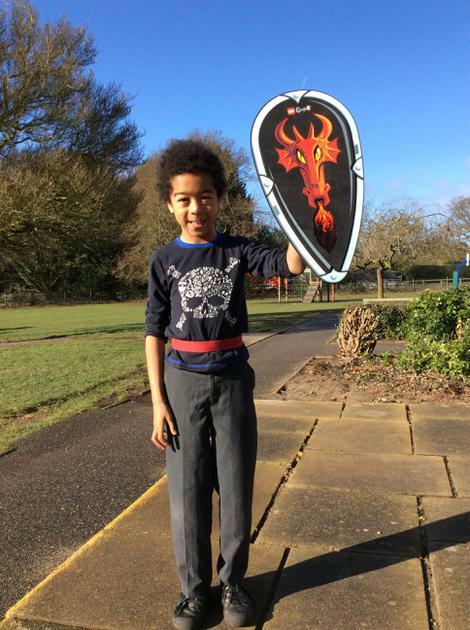 This proved to be an exciting way to start our English lesson on a warm Wednesday afternoon. 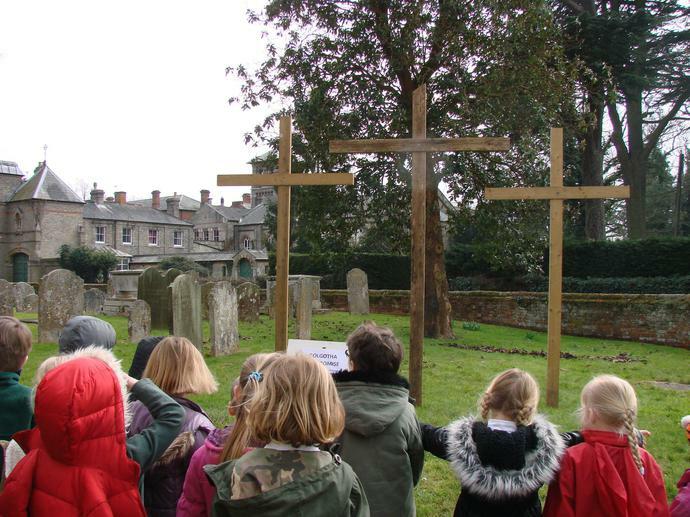 Today Year 3 walked to St Mary's Church to learn the story behind the Easter holiday. 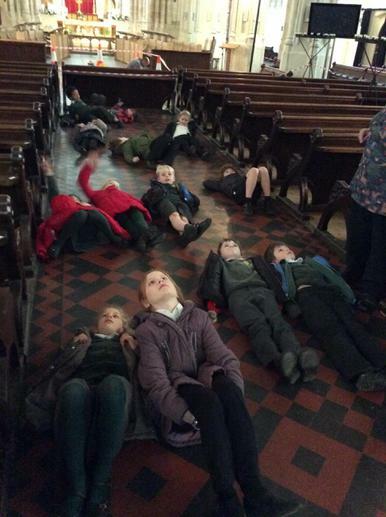 We were taken on a journey around the church grounds, where we explored various stations which told the story in a creative way. 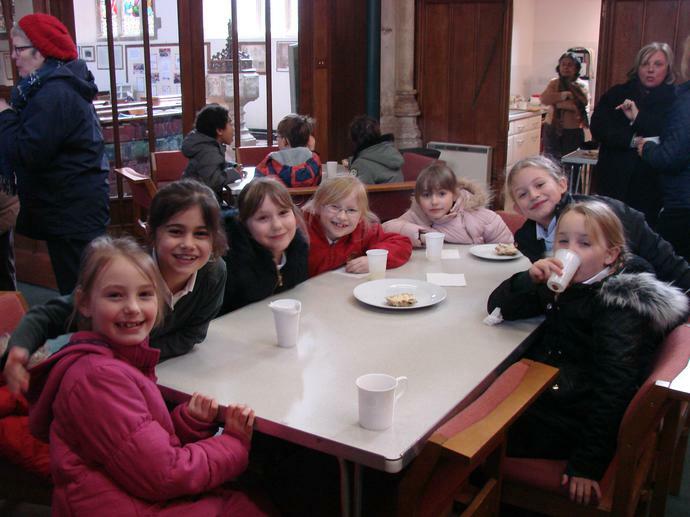 At the end we were treated to a hot cross bun each, yum! 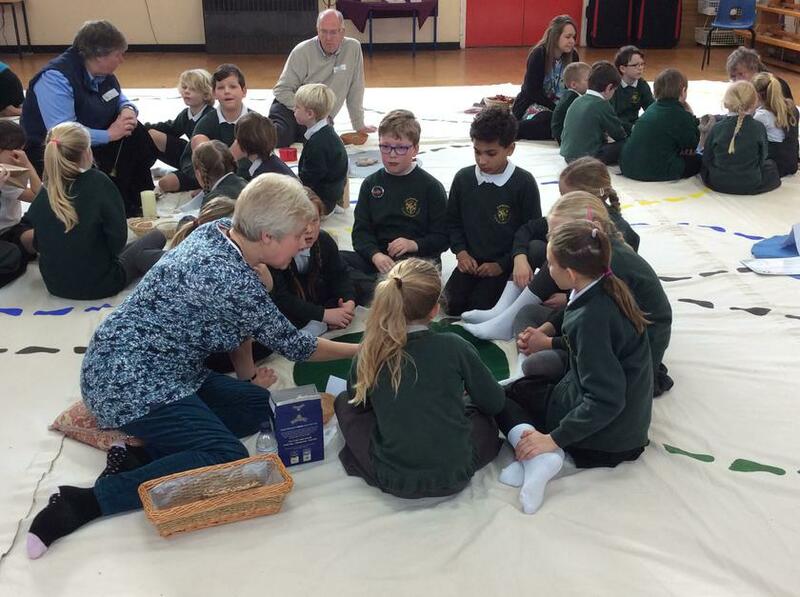 Thank you to all the members of the church for organising such a fun and educational day. 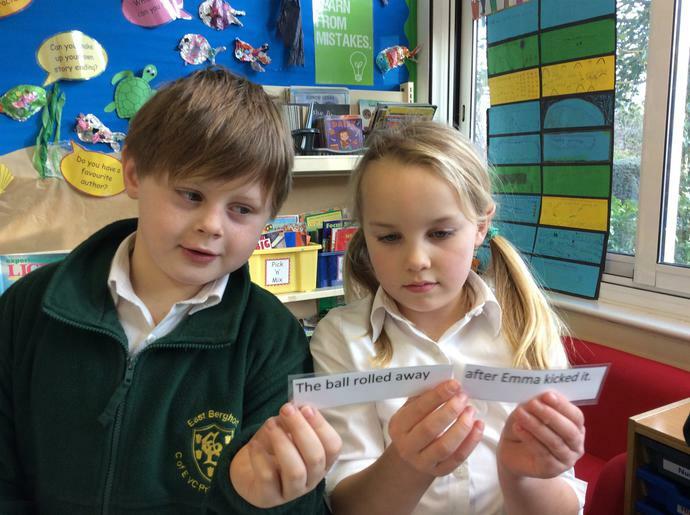 On Monday, we practised using prepositions in our grammar lesson. Prepositions are a group of words that can be used to describe where something is in relation to something else. 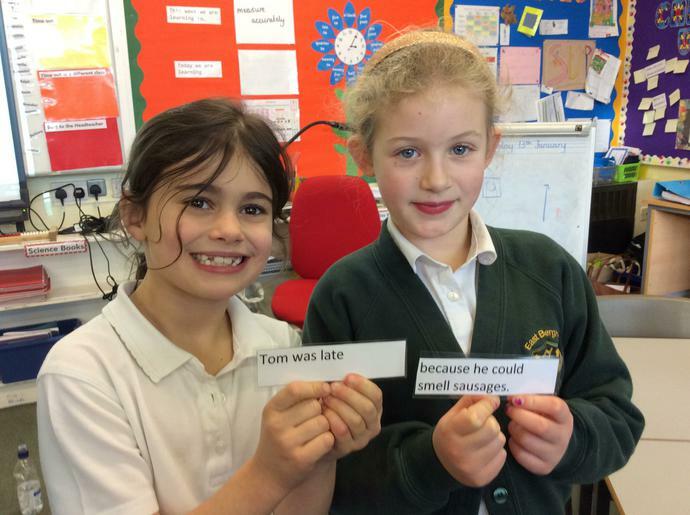 In pairs, we wrote sentences about where the toys were in relation to us (using a range of prepositions). 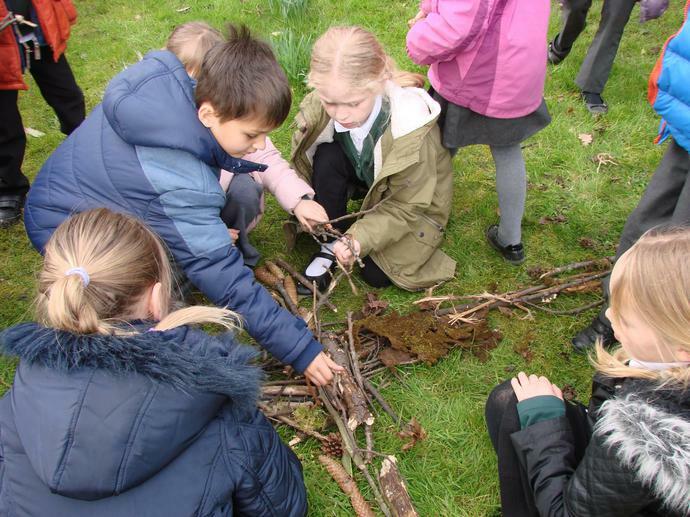 On Friday morning Mrs Skinner took Year 3 outside to use our new outdoor classroom. 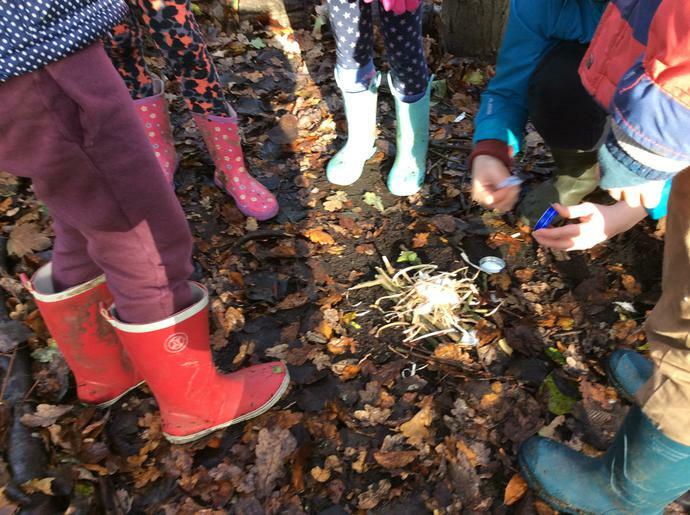 The class have now started a new gardening project, where they will be growing cabbages in a range of different soils to see if they affect the cabbages at the end. 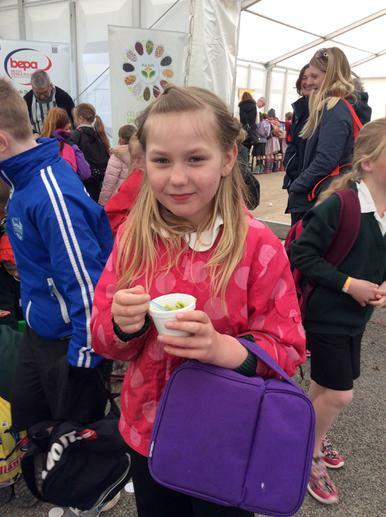 Keep checking the class page to monitor our progress on 'Cabbage Watch!'. 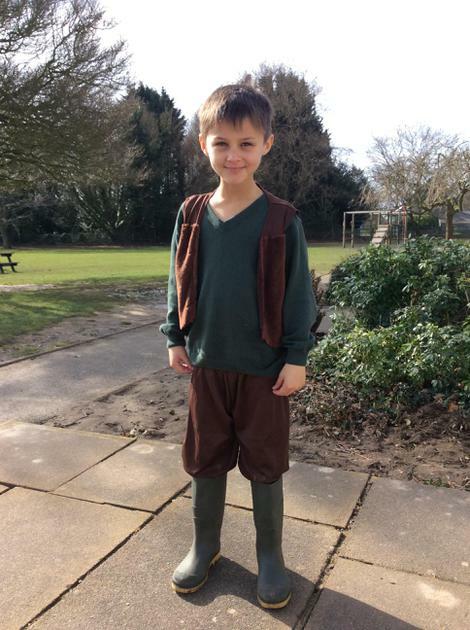 Today the class have had a wonderful time celebrating World Book Day. 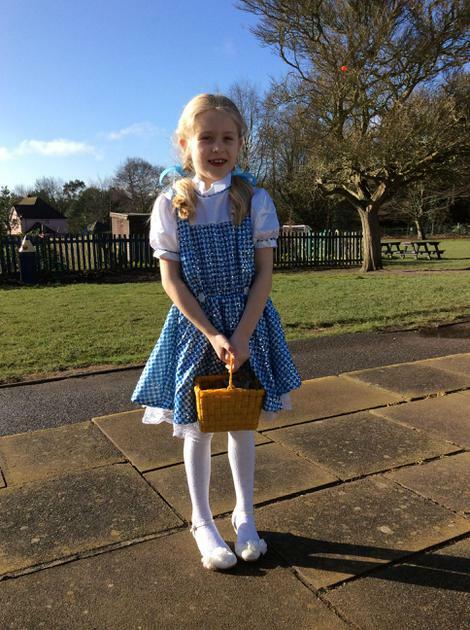 Each child came into school dressed up as their favourite book character, and as you can see below, everybody looked fantastic! 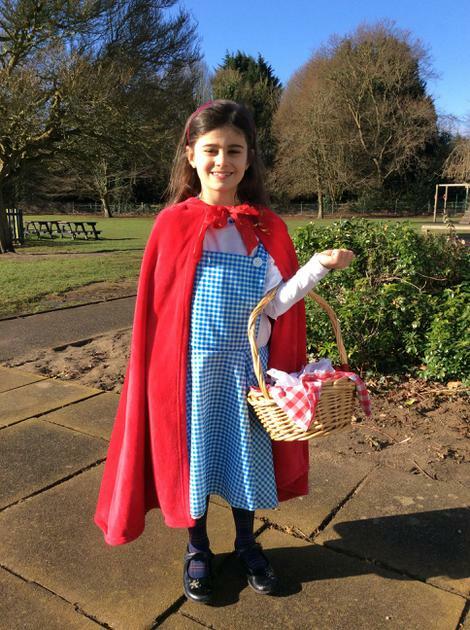 In the afternoon we took part in some World Book Day activities, including drawing and describing the characters we had dressed up as, aswell as taking part in a word scavenger hunt. 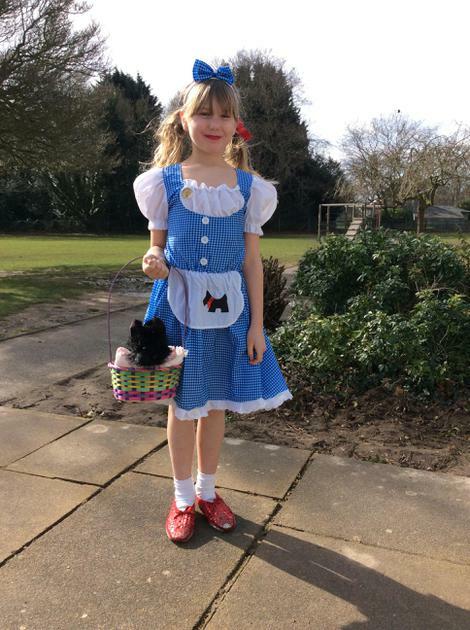 Thank you to all the family and friends who helped with the costumes, the class looked wonderful. How many characters can you name? 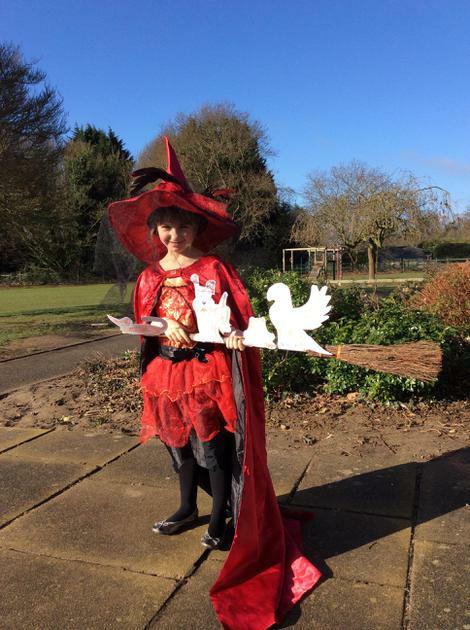 World Book Day Website Today the children saw an inspirational video from authors and illustrators giving them advice on how to write their own books. Click the link below to discover more good tips on how to write great stories! 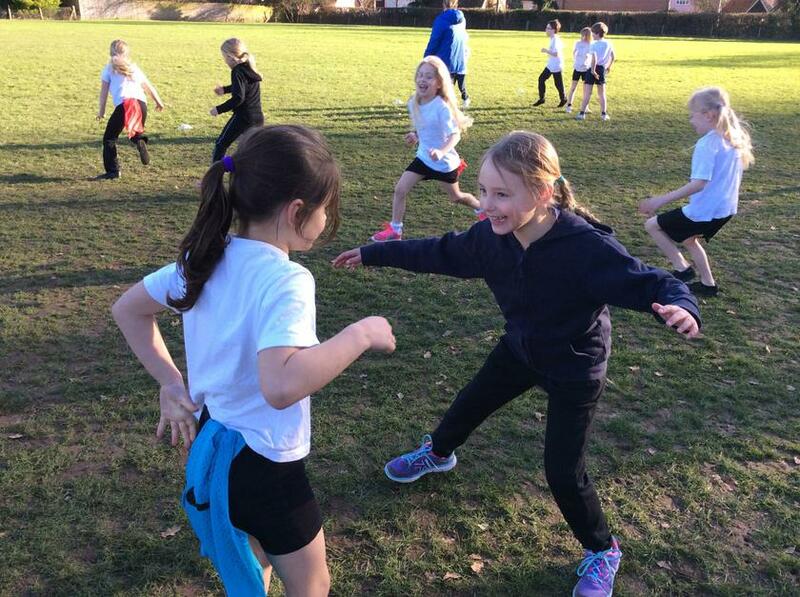 Yesterday afternoon Rosie led another exciting football session with Year 3. 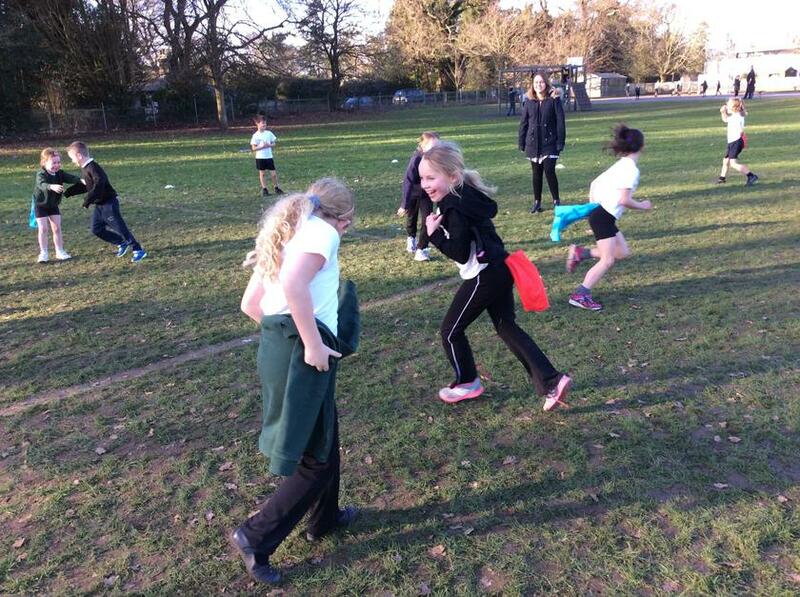 This week the children were split into four groups, playing mini matches with every other team. 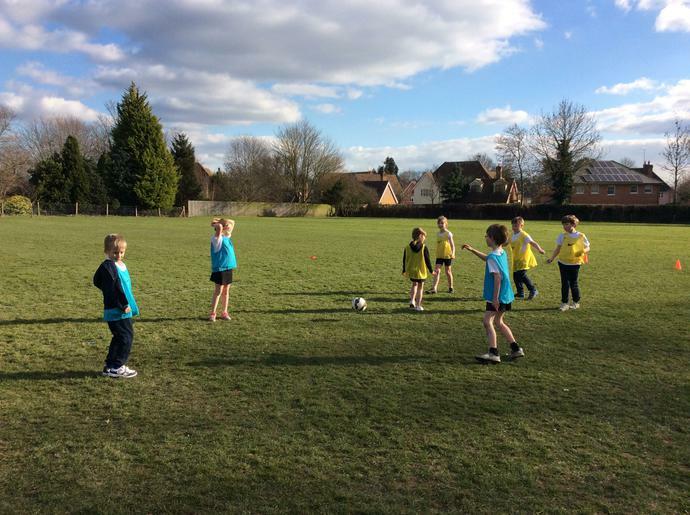 It was great to see children really supporting other players, passing to everybody in their team and praising good passes and possessions. Today in English we were given a scripted version of the famous Roald Dahl tale,The Twits. 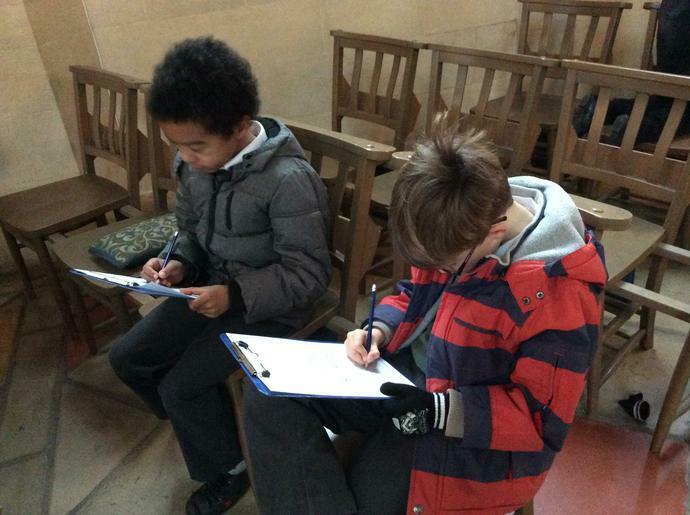 Working in small groups, we each played a certain character and practised reading our lines clearly with expression. 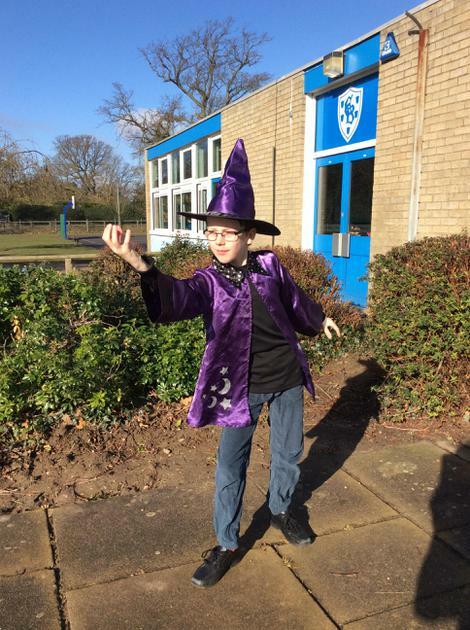 As well as using our voices effectively, we were also challenged to read and use the stage directions on our outside stage. 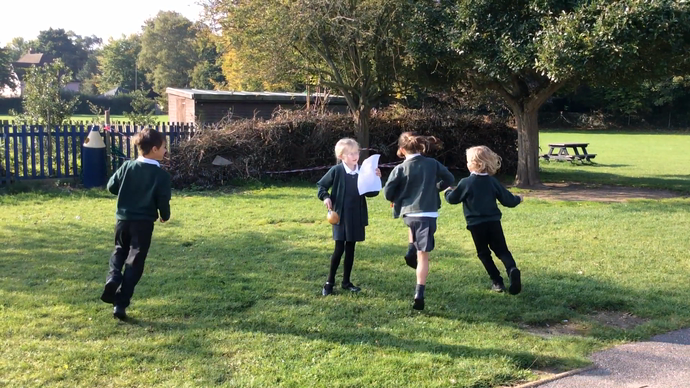 At the end of the lesson, each group performed our plays to the rest of the class (taking full advantage of the brighter weather). 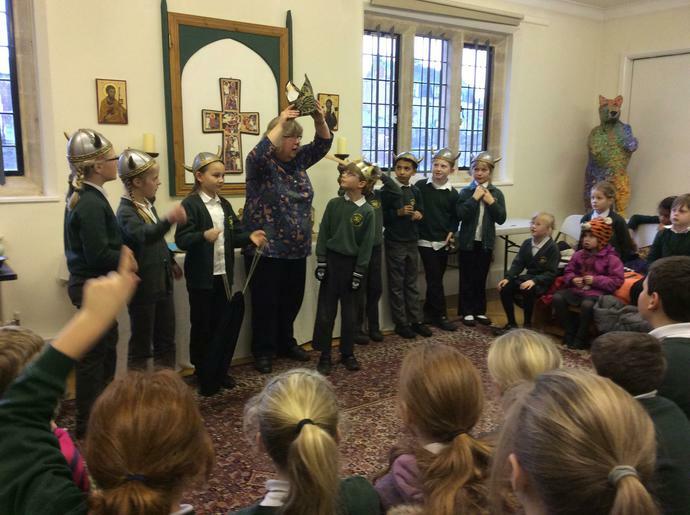 Today Year 3 and 4 had an exciting morning making their way through a labyrinth in the hall, taking part in a wide range of different activities associated with bible stories. 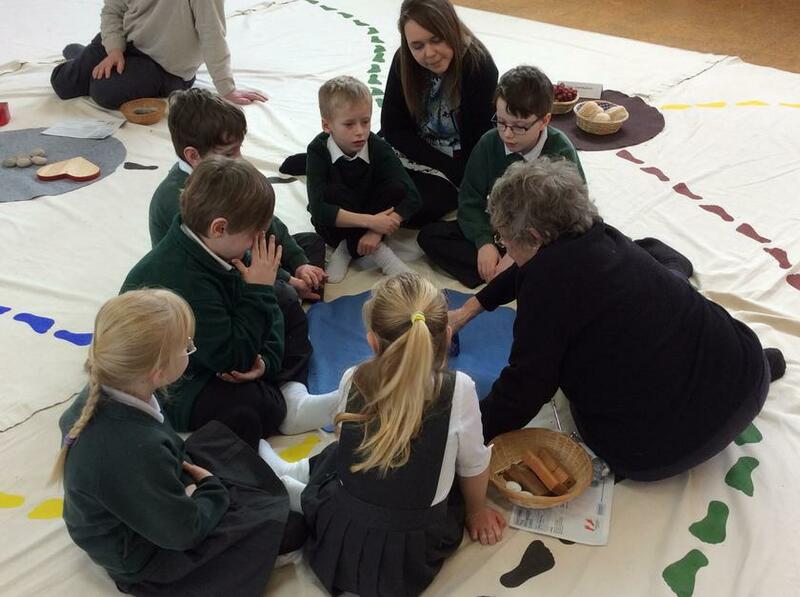 The morning was a great success, with the children working in small groups using hands-on resources to bring each story to life. 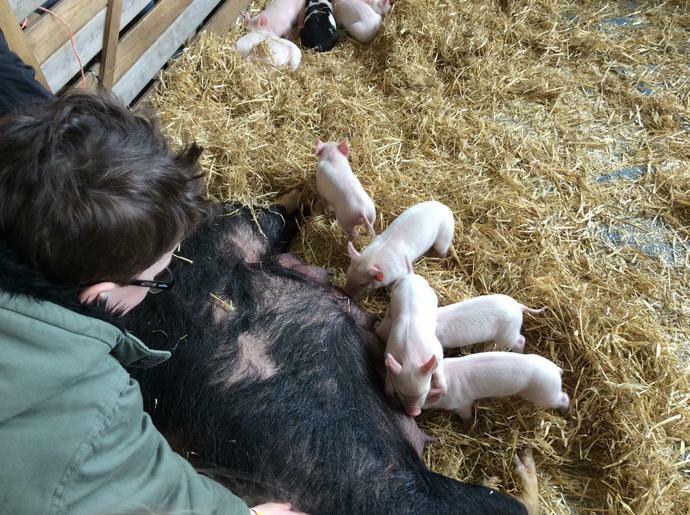 Thank you to the everybody involved in organising and running such a relaxing and educational morning. 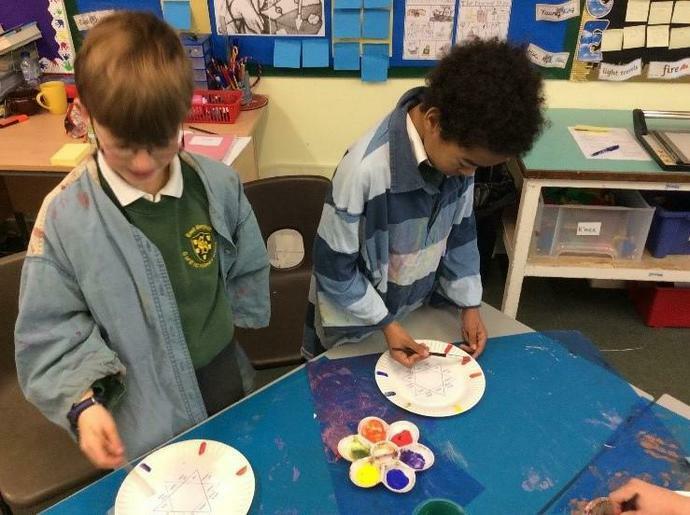 Earlier in the week, Marcel and Philippe came into our school to run a range of different musical workshops with each year group. 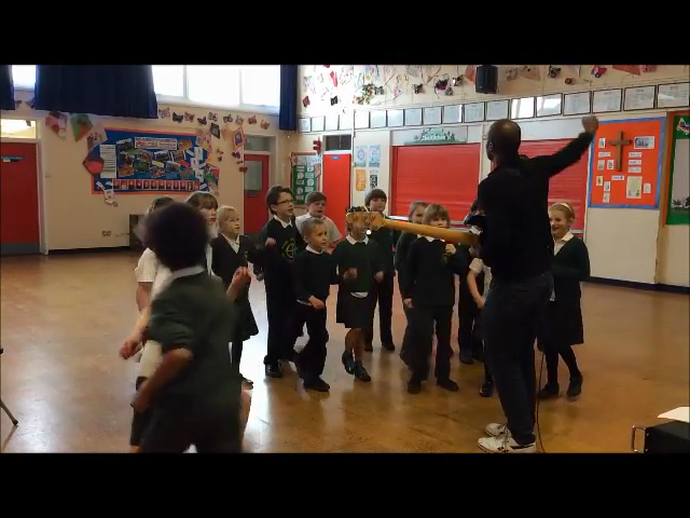 These energetic workshops encouraged children to use and understand musical terms such as tempo, beat and bar, applying their new knowledge when performing with a live band. 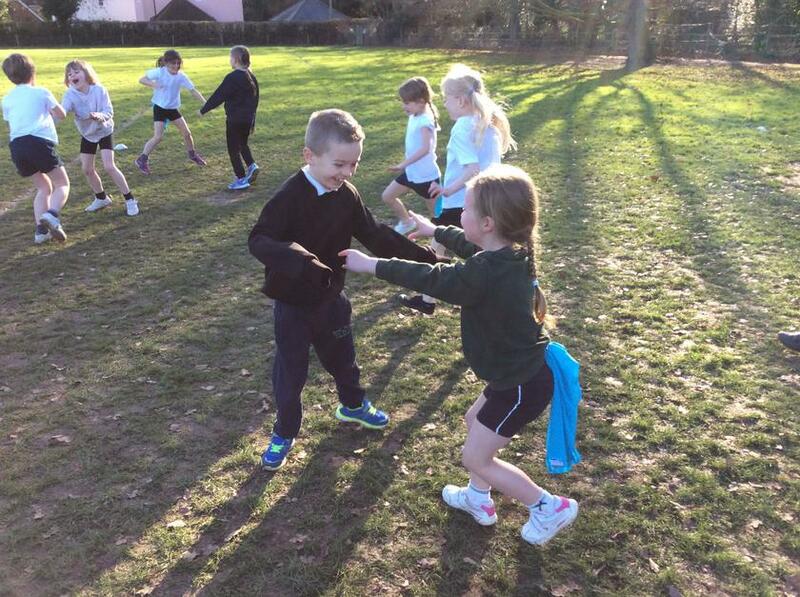 During our exciting session, we all learnt a new song about pirates! 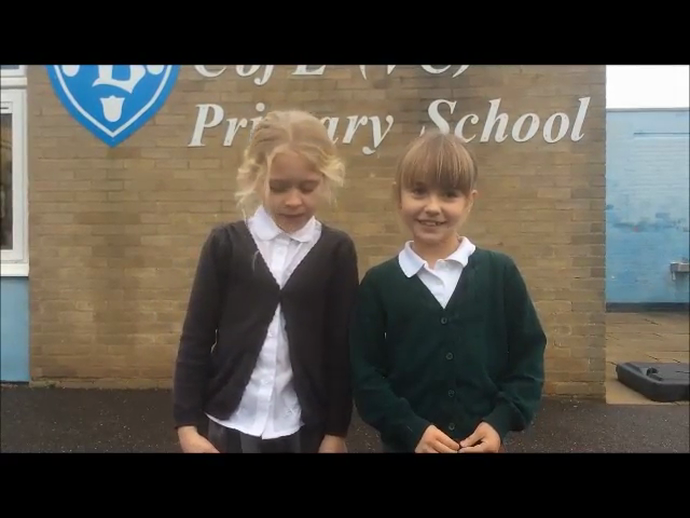 Take a look at the video below to see us perform. 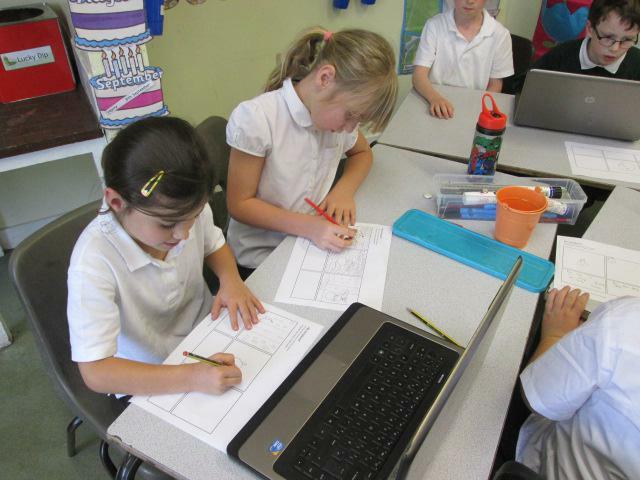 This week in English, we have been planning and writing our own Greek myths based on Pandora’s Box. 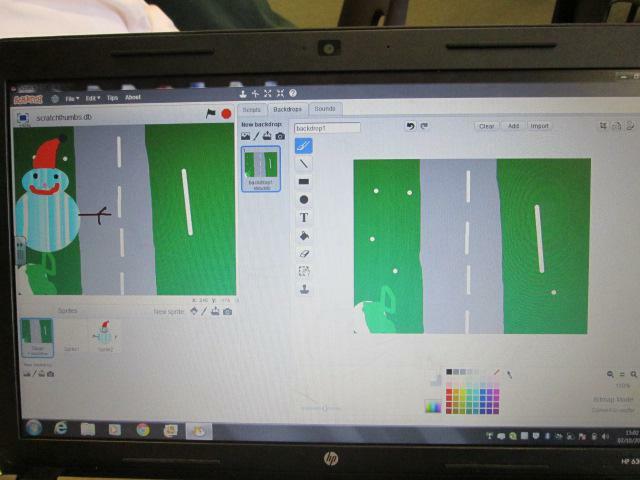 On Monday, we used the computers to design a setting for our myth and draft ideas of how to describe this setting. 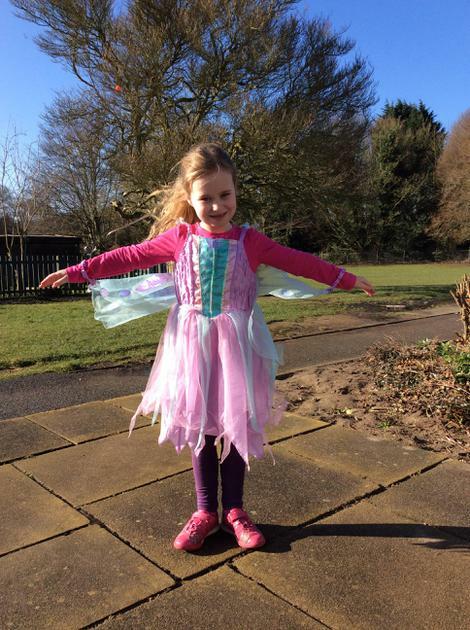 Our Science topic this half term is 'Light'. We have already learnt how materials can be described as opaque, translucent or transparent, and that their transparency affects the shadow they make when blocking a light source. 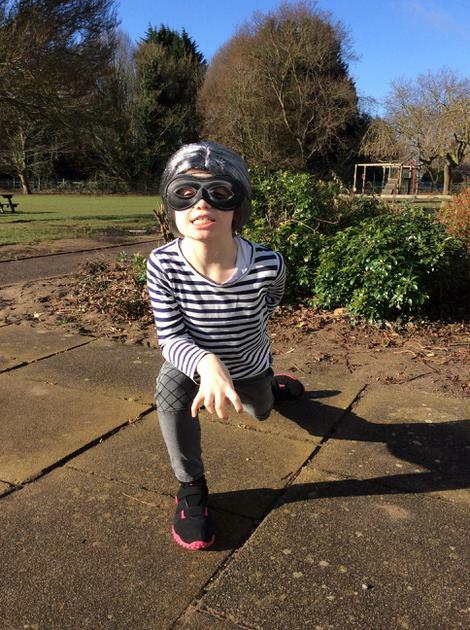 Today we have been learning about how light reflects off everything we see, with straight beams of light reflecting light into our eyes so we are able to see them. 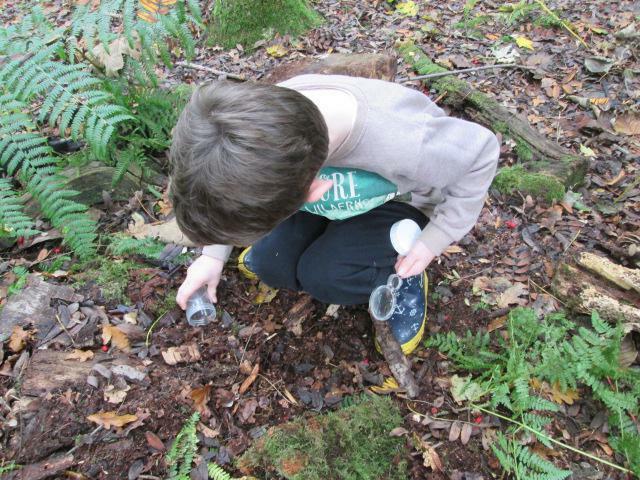 To demonstrate how mirrors reflect light, we created periscopes which enabled us to see over the top of opaque objects. 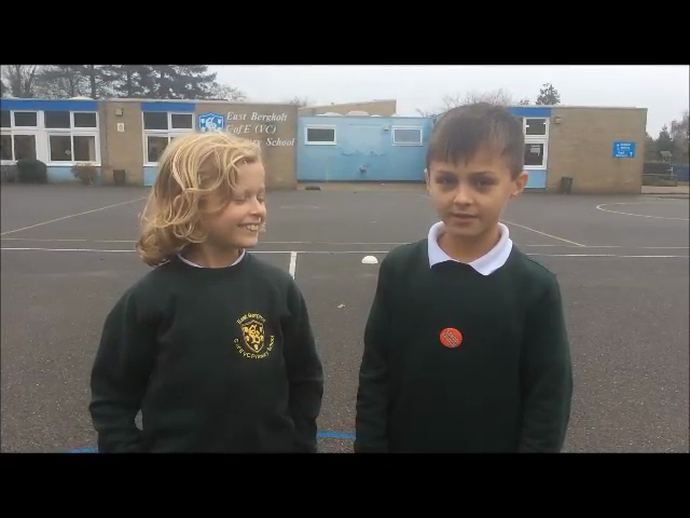 At the end of the lesson, we discussed how we could make a periscope that would enable us to see on top of the school roof. 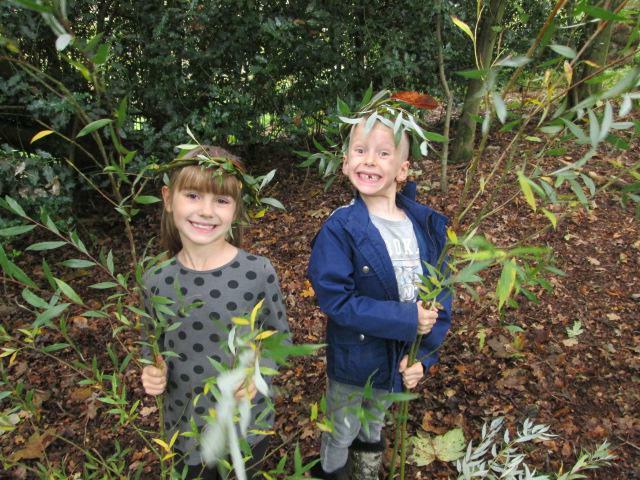 A fun afternoon was had by all! Today in English we continued to learn how we use inverted commas (speech marks) to punctuate what a character is saying in our writing. We worked in partners to read passages from Pandora's Box, then we used macaroni pasta to add commas and inverted speech marks where needed. 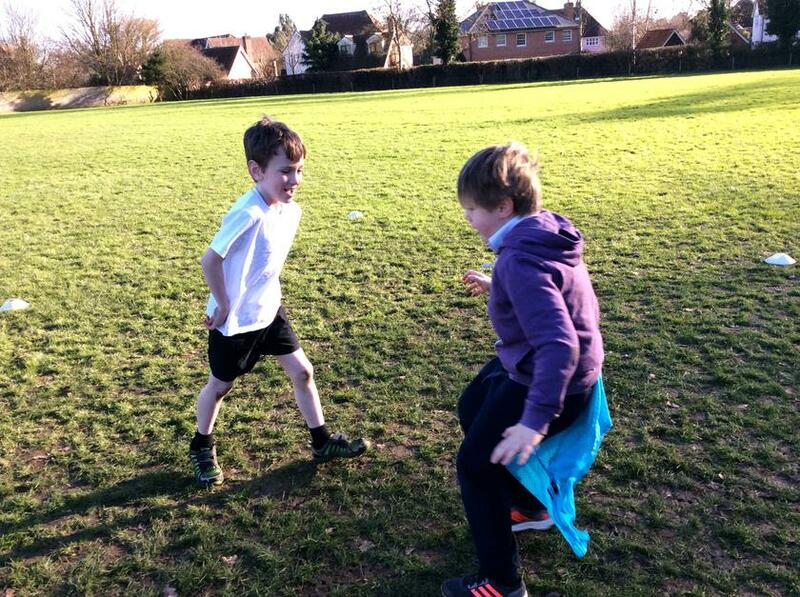 Afterwards, we read unpunctuated sentences as a class, using our ‘kung fu’ moves to add in the correct punctuation. 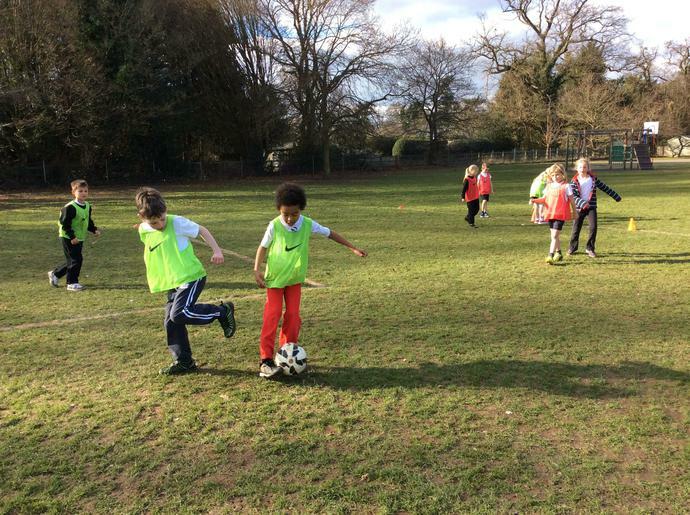 For the next 6 weeks, Year 3 will be having football sessions every Thursday afternoon with Rosie (a fantastic football coach!). 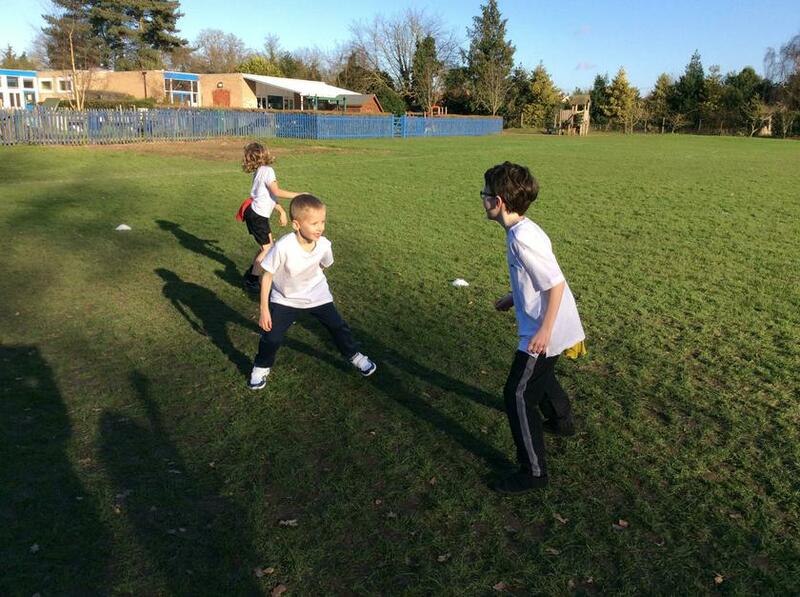 Today the children focused on keeping possession of the ball and tackling safely. 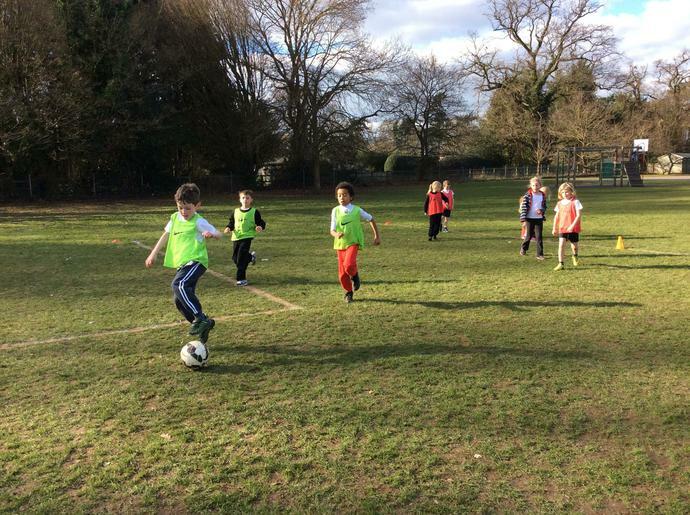 If children have shin pads at home, they are allowed to wear them during these sessions. 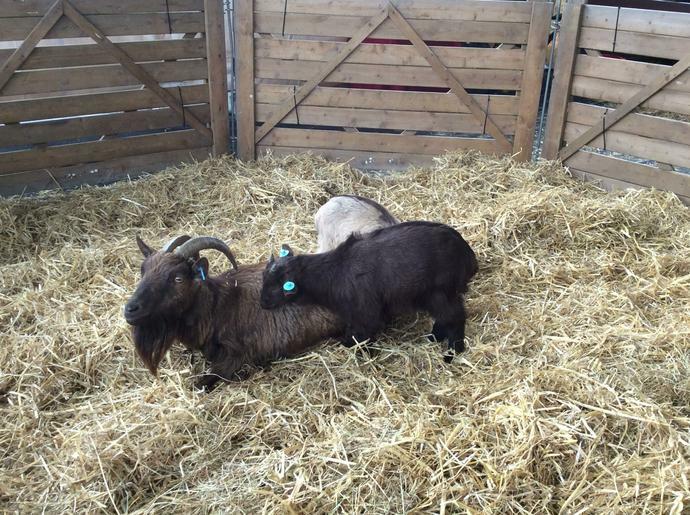 See below to see them in action! 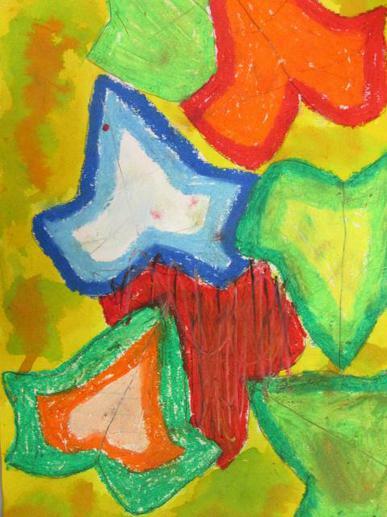 In Art we have been learning about colour. 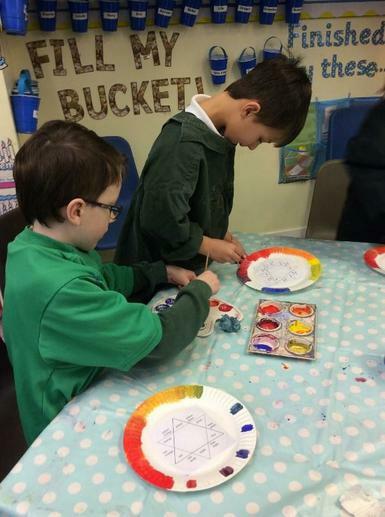 Today we looked at Kandinsky’s artwork, and were inspired to create our own colour wheels. 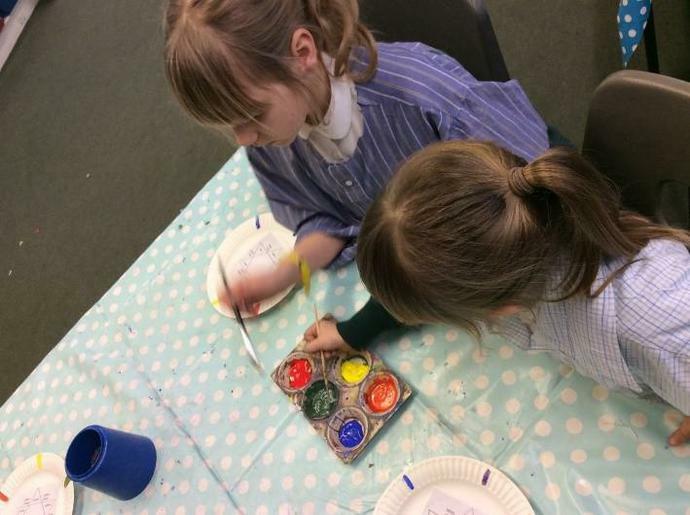 These helped us to learn how primary colours can be mixed together to create secondary colours. 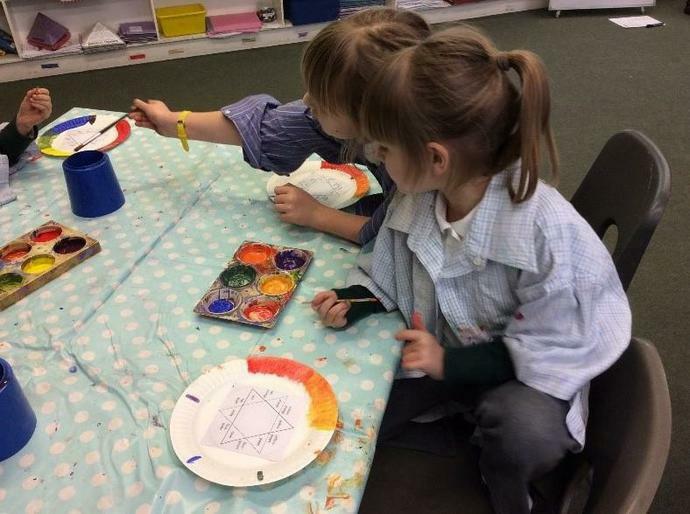 We will be using our colour wheels throughout this half term during our Art lessons to help us create different shades in our artwork. 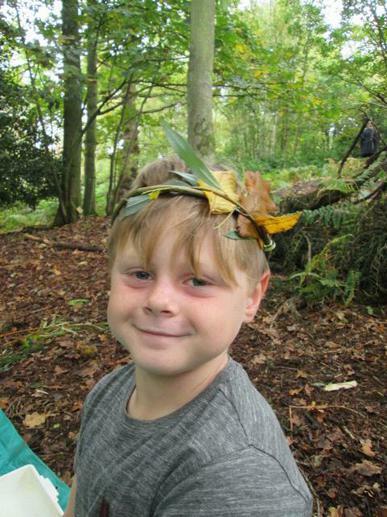 This week in English we are learning about Greek myths. 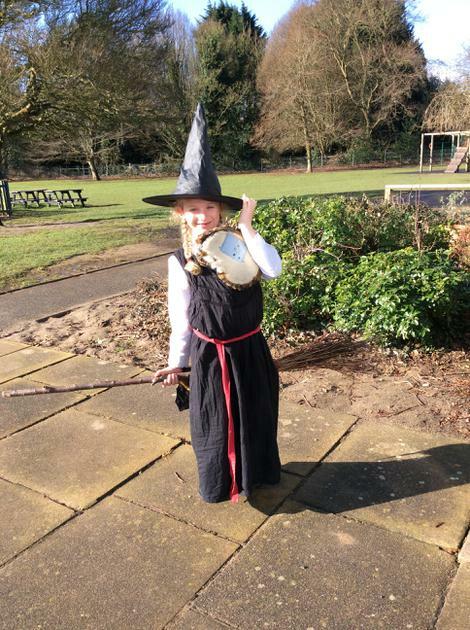 Yesterday we took part in some drama activities to explore the myth Pandora’s Box. 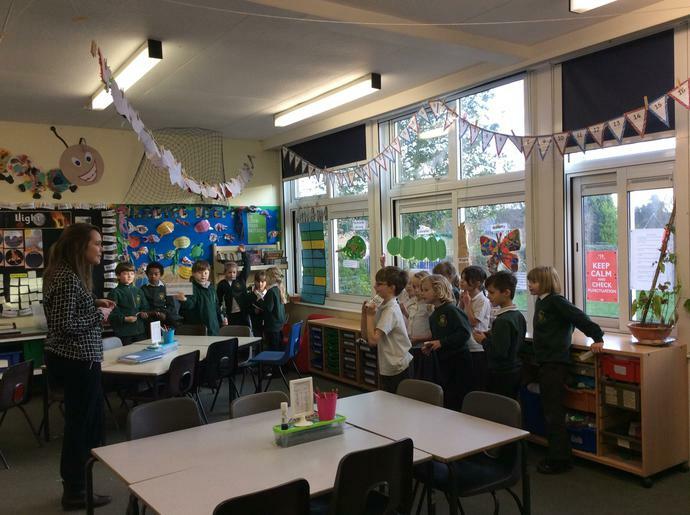 In our ‘conscience alley’ we discussed whether or not Pandora should open the box. 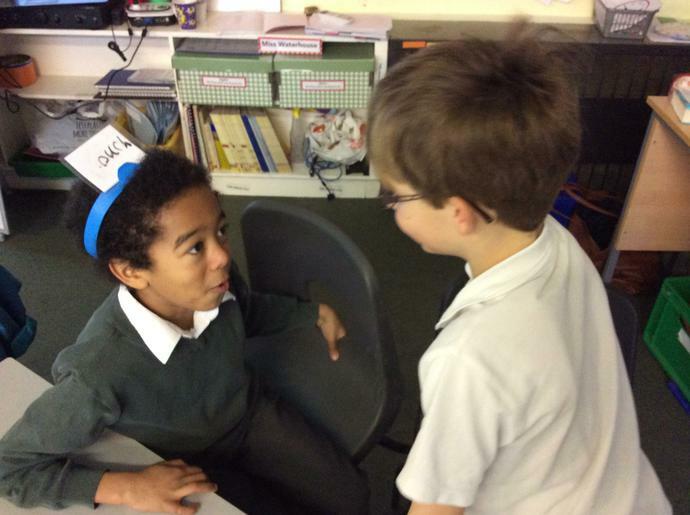 We thought about how Epimetheus felt in the story, as you can see from the expression on our faces below. 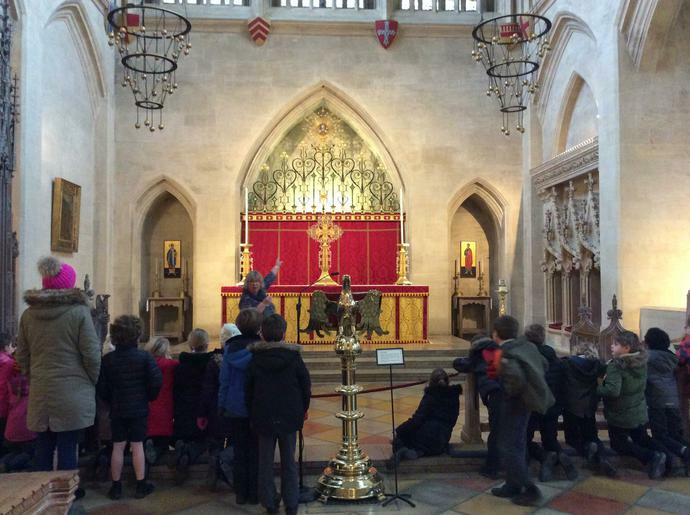 Last week Year 3 and 4 went on a pilgrimage to visit St. Edmundsbury Cathedral to learn more about St. Edmund the Martyr. 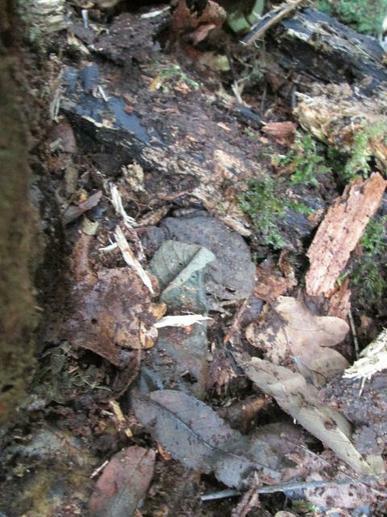 Despite the drizzly weather, the trip proved to be a great success. 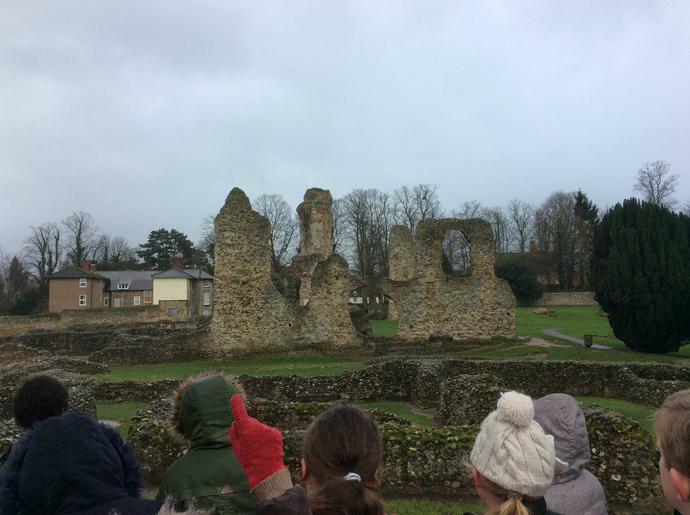 Throughout the day we were treated to a walk around the cathedral, a tour of St. Edmund's resting place and an afternoon full of arts and crafts. 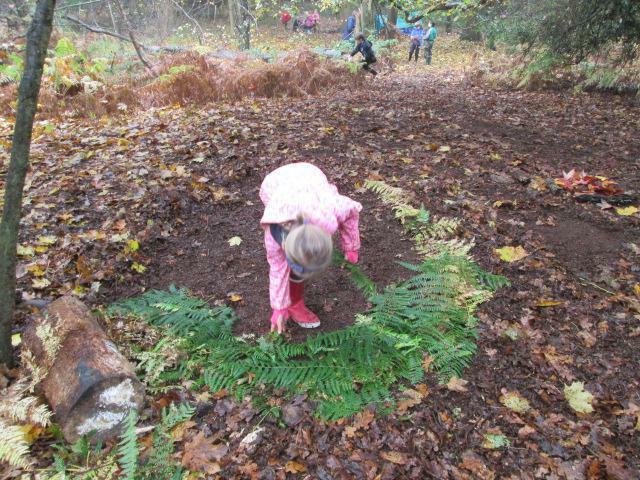 Thank you to the parents who joined us for the day, take a look at the photos below to see the children getting stuck in. 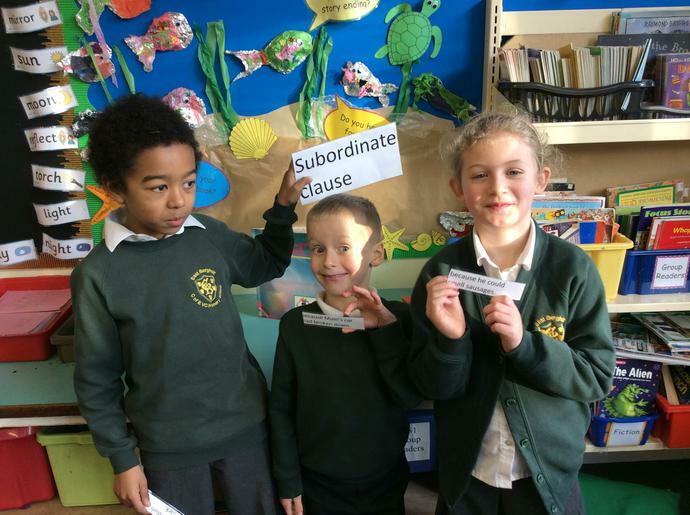 Yesterday in English Miss Brooke taught us what a subordinate and main clause is. 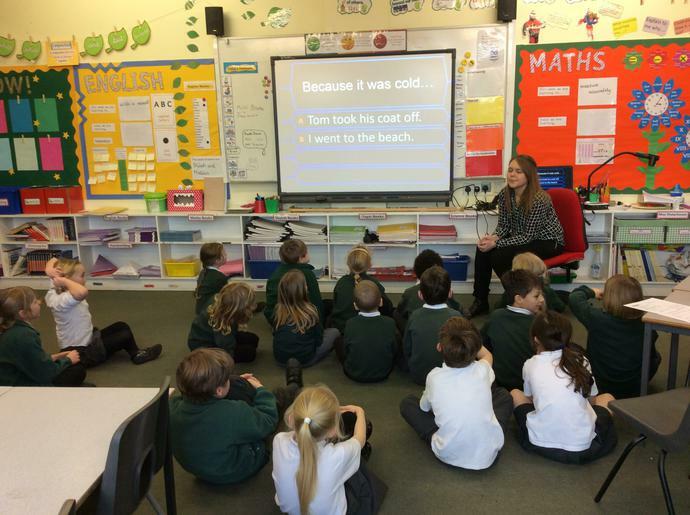 The children were given a range of clauses, and had to decide whether they had been given a subordinate clause or a main clause. 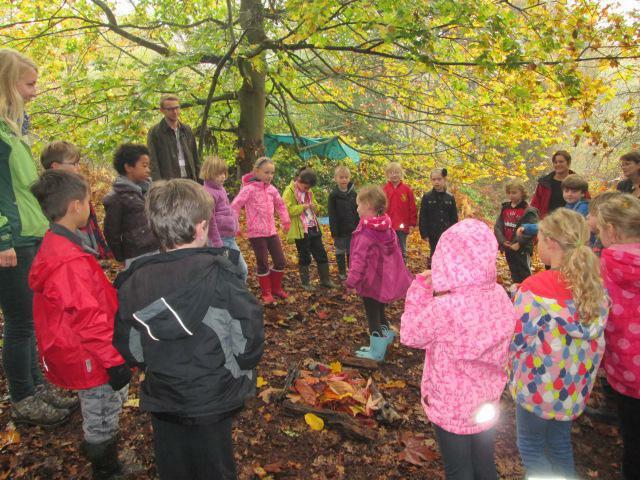 They then had to organise themselves into groups according to the clause they had. 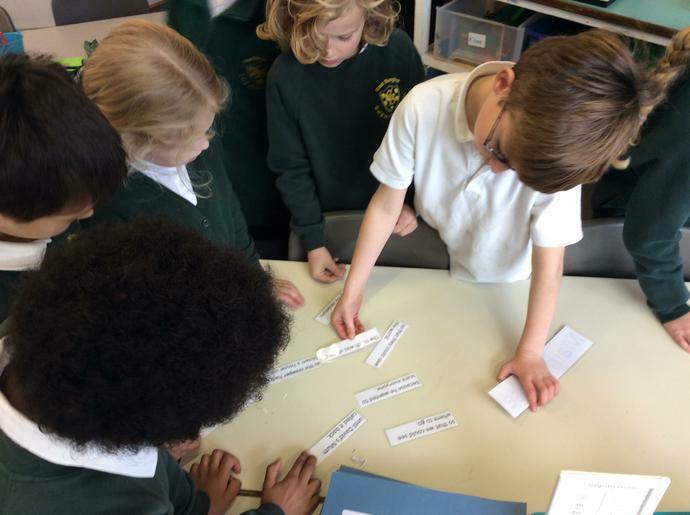 Each child then had to find a partner and make sentences together. Finally, we played 'Who want to be a Millionaire?' to apply our learning. 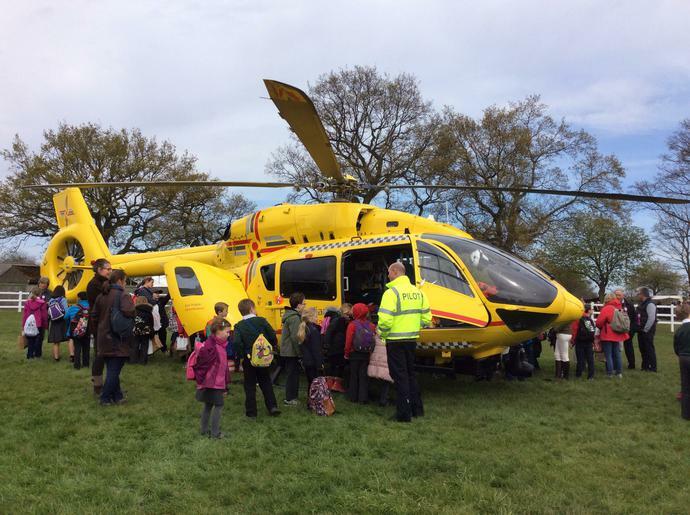 See the photos below to see us in action. 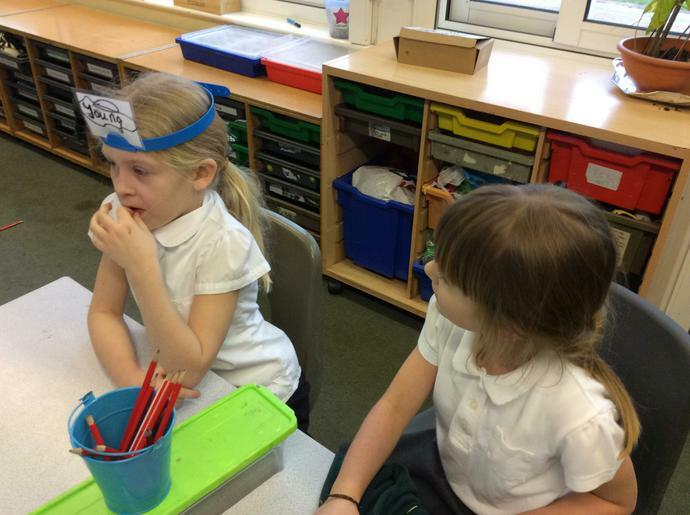 Today the class continued to practise unusual words spelt using the 'ou' phoneme. These are a tricky collection of words because they are all spelt with 'ou', but they sound different in each word. For example, 'cousin' sounds completely to the 'ou' phoneme in 'your'. 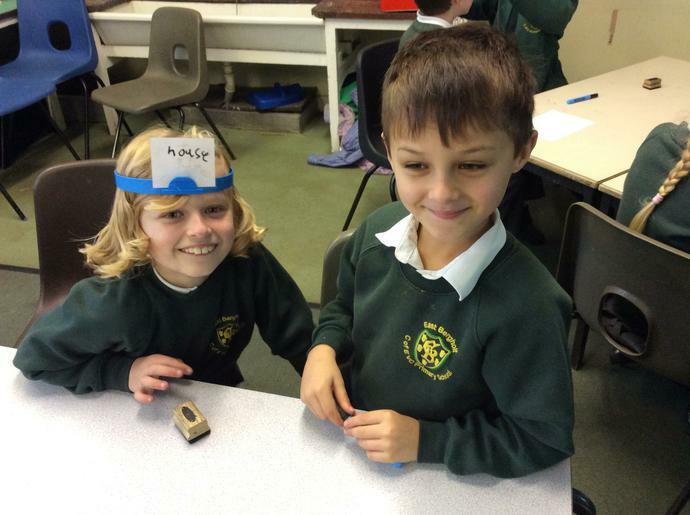 To help us remember how to spell these words, we chose an 'ou' word for our partner, wrote it on a card and had them wear it on their forehead. 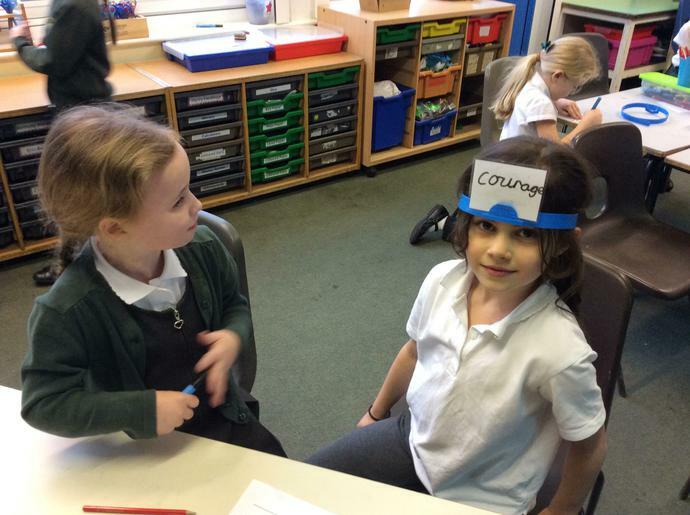 Our partner then had to ask us a range of questions so they could guess the word they were wearing. 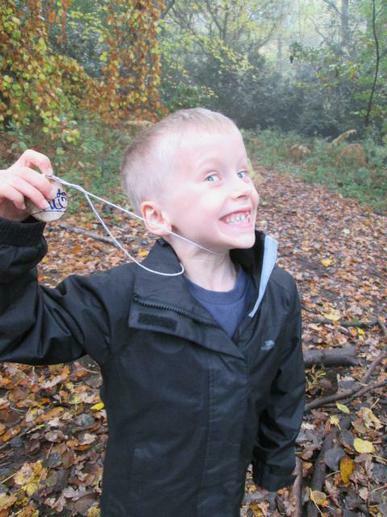 We had lots of fun learning difficult words this way, see our photos below to see us in action. 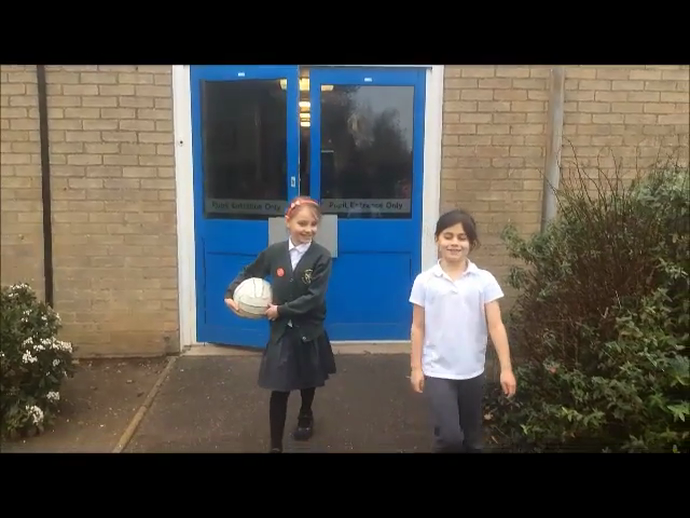 Over the past few weeks, the children have been planning a short video to help teach the audience a certain skill in P.E. 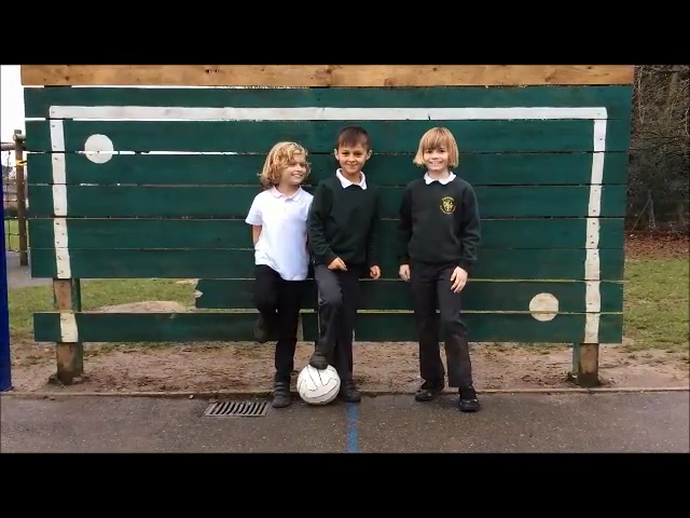 In preparation, we evaluated a range of different sport presenters, looking at the way they spoke, their actions and how the camera moved around them. 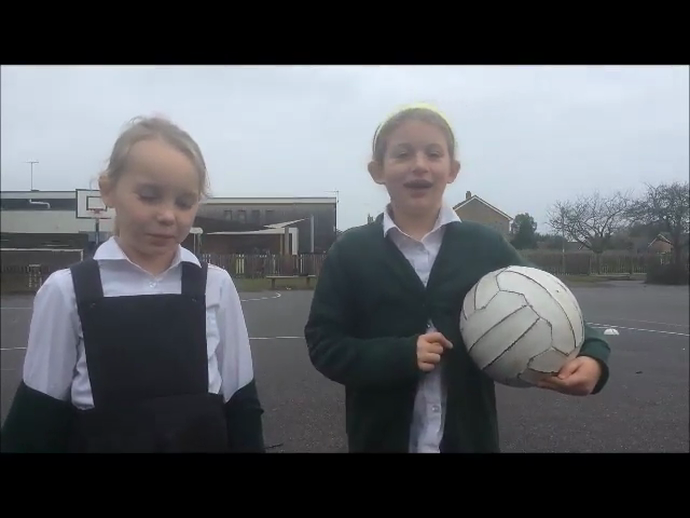 After this, the class then worked in pairs to choose a P.E skill to focus on in their video. 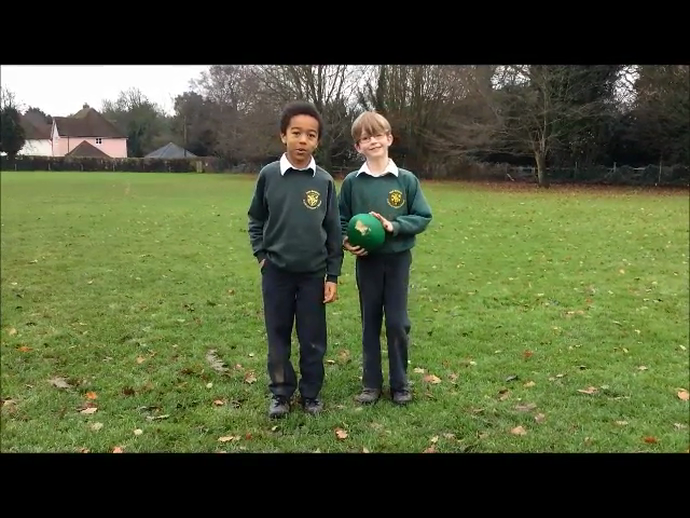 Have a look at the finished films below . 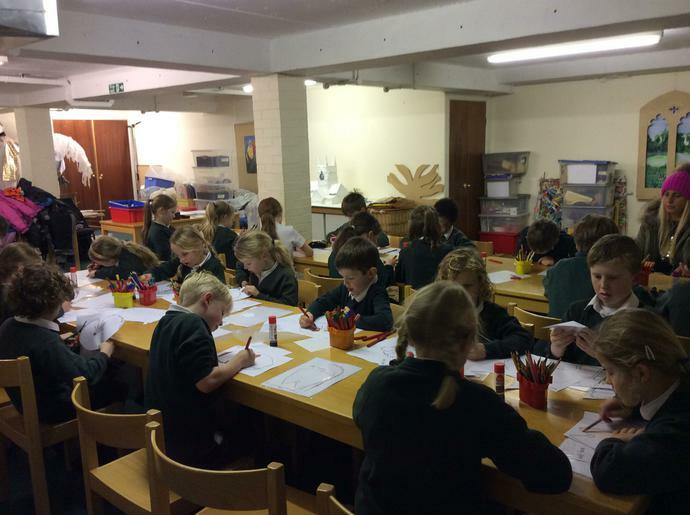 Today Year 3 completed their nativity themed art pieces. Each picture depicts the silhouette of Mary, Joseph and the baby Jesus at the stable after his birth. 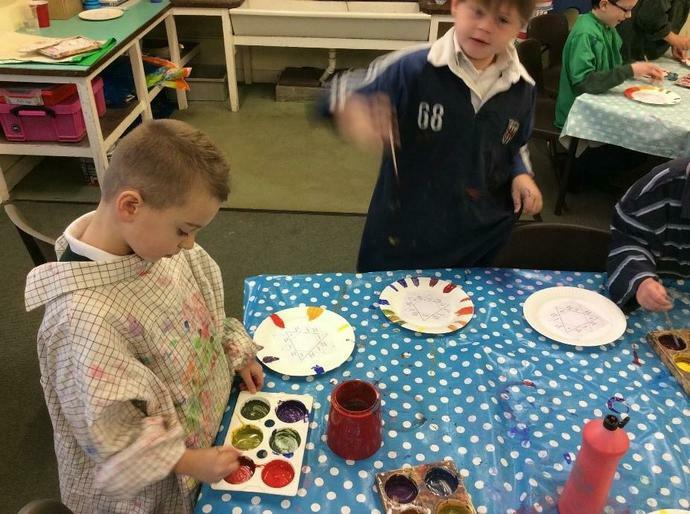 We created the background by mixing blue, red, white and black poster paint to create different shades. 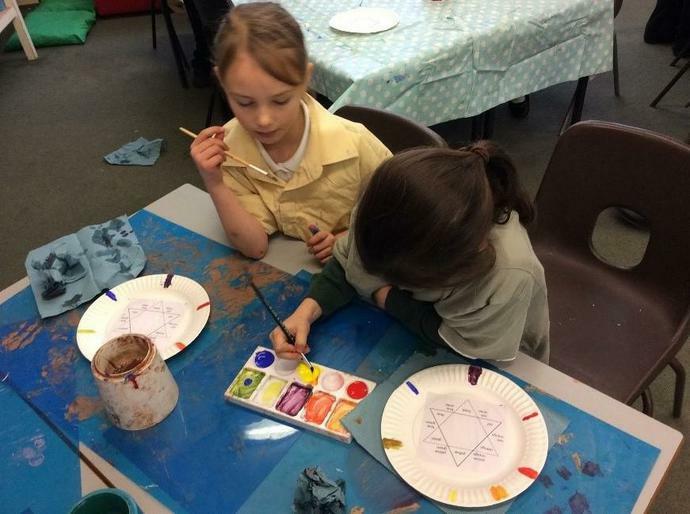 This helped us to create an ombre effect, spiralling from the centre of the page. After painting our background, we used a template to cut out each figure from black sugar paper. Finally, we stuck these down once our paintings had dried. These are currently on display in the classroom, and will be taken home at the end of next week. 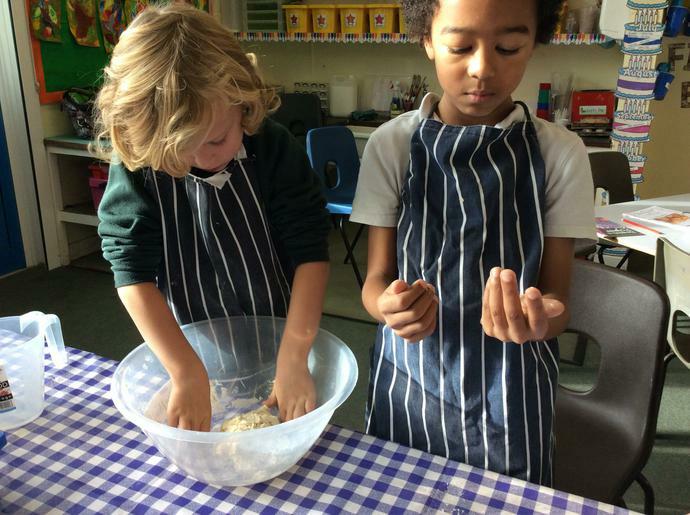 On Friday afternoon the children worked in mixed ability pairs to answer a range of challenging questions related to our current maths topic, measurement. 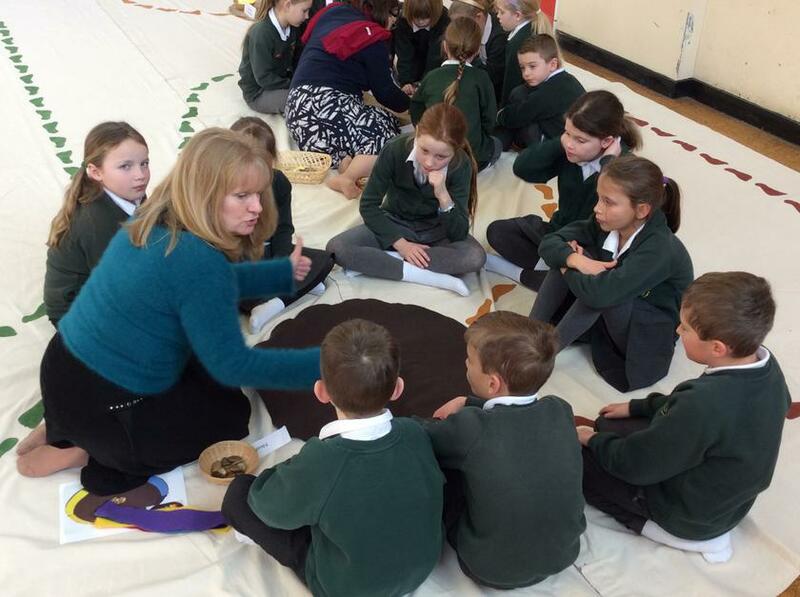 Before the children got stuck in, we discussed how we could approach the problem, using a conversion chart to help us. 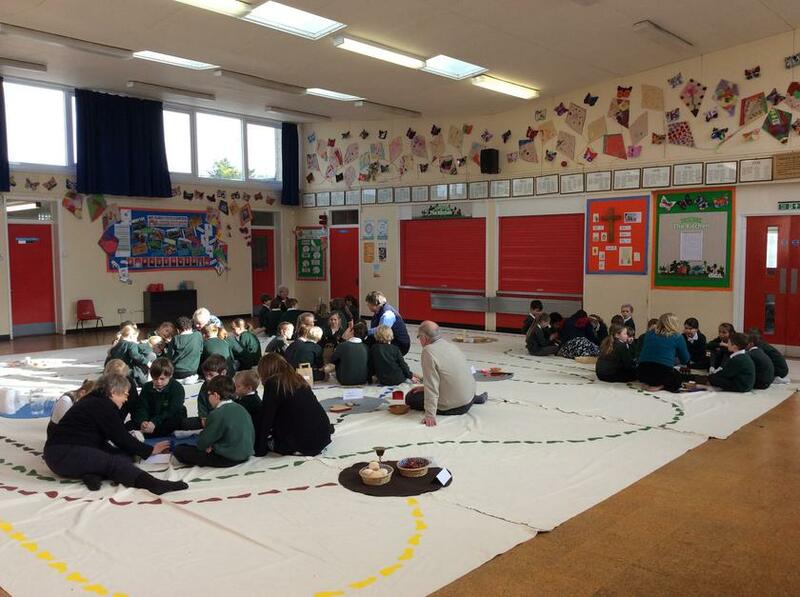 It was great to see the children working collaboratively, drawing what they already knew on sugar paper first, before tackling the problem together. At the end of the lesson it was interesting to see how different pairs approached and solved each question. 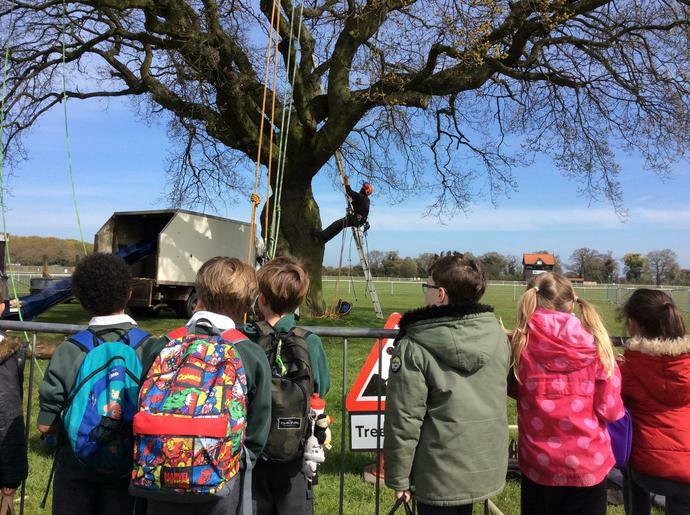 See a selection of our workings below. 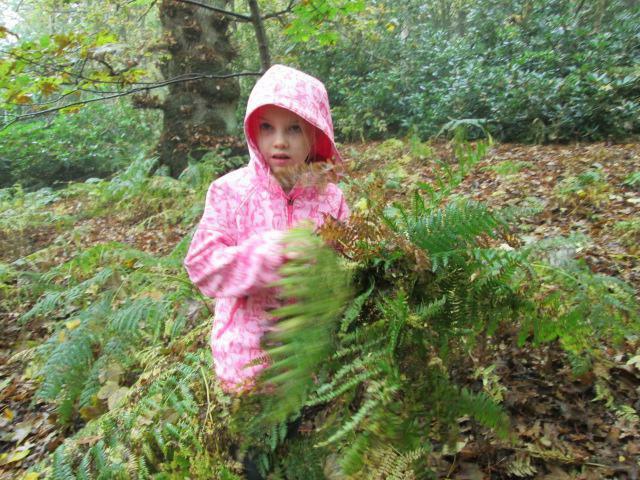 Today we had our final forest school session with Lizzie. 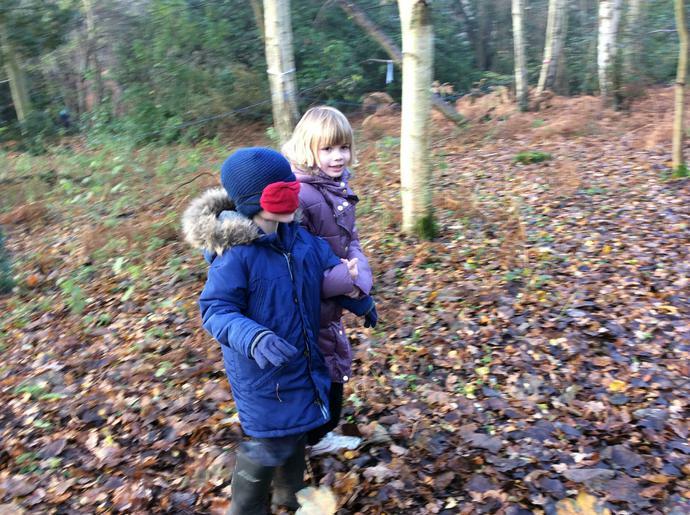 Again we were lucky to have a bright, crisp morning in the woods where we learnt a new game imitating bird calls. 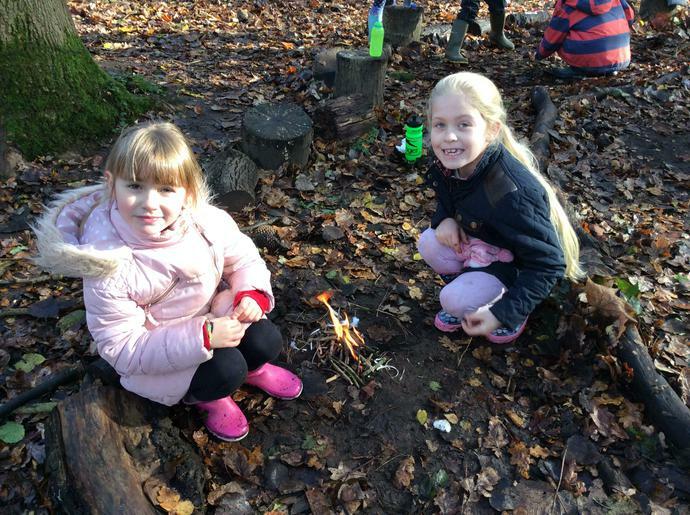 Lizzie also made our last session very special by treating us to bread and marshmallows, which we were able to cook on the fire. 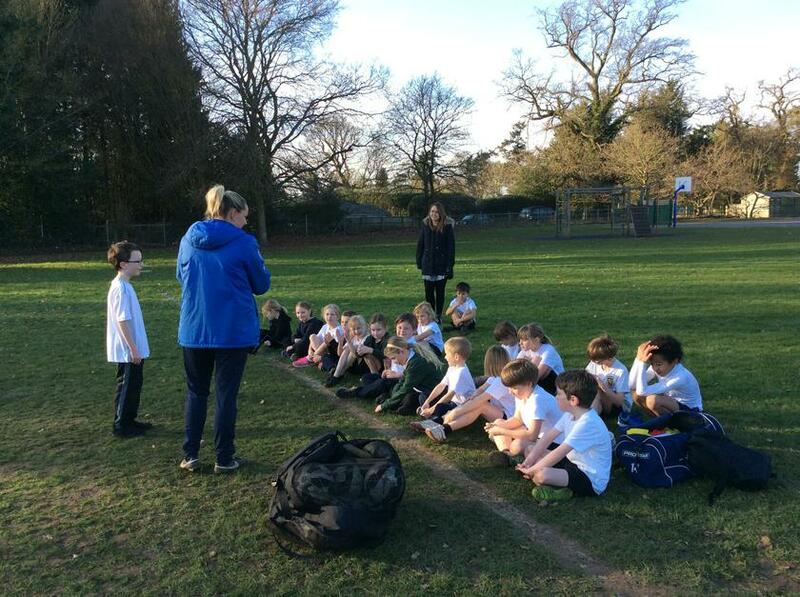 A big thank you to Lizzie and all the parent helpers who have joined us over the past six sessions. 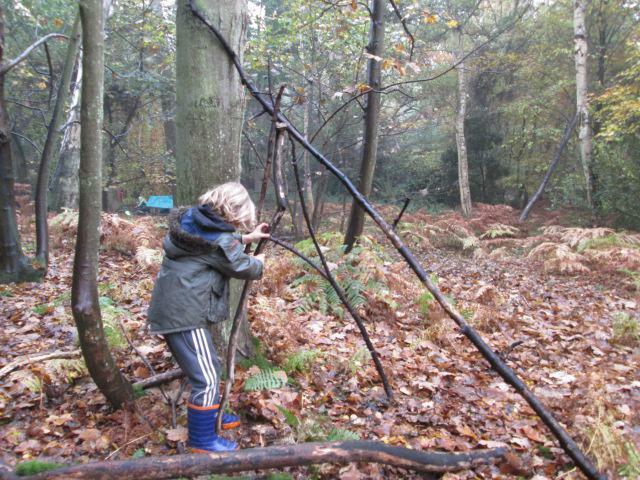 The children have thoroughly enjoyed developing a range of different skills, ranging from team building to using tools, jewellery making to den building. 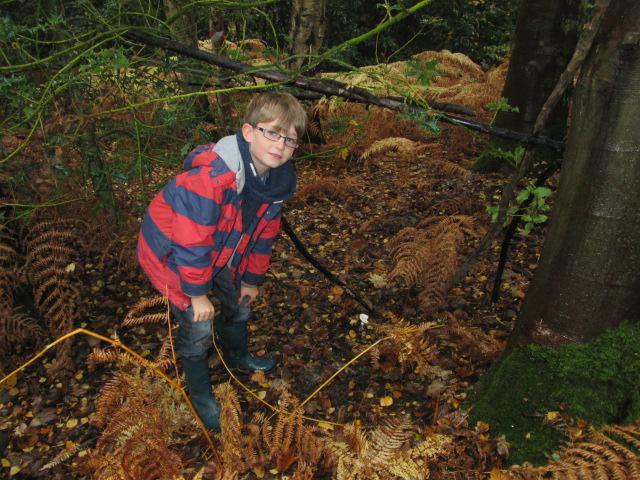 Have a look at our final set of photos below. Today we have been multiplying and dividing numbers by 10. To help us understand how the digits move when solving these calculations, the class worked in pairs to create their own place value grids in chalk. Next, the children put their 2 and 3 digit numbers into the grid, moving them one place to the left to multiply them by 10, and moving them one place to the right when dividing by 10. 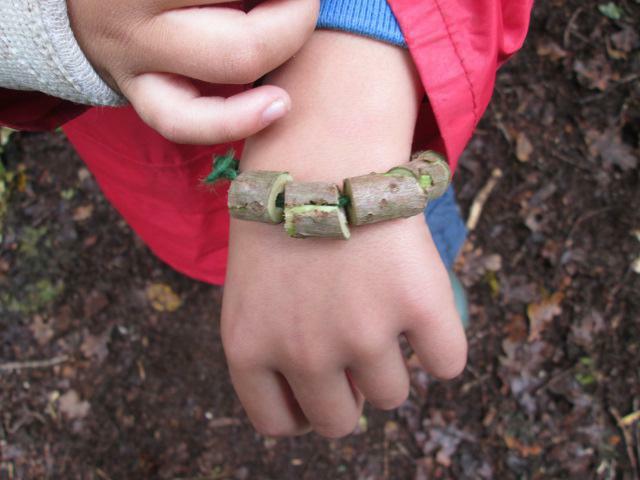 This really helped the class to explore this method kinaesthetically, reinforcing our learning in the classroom. 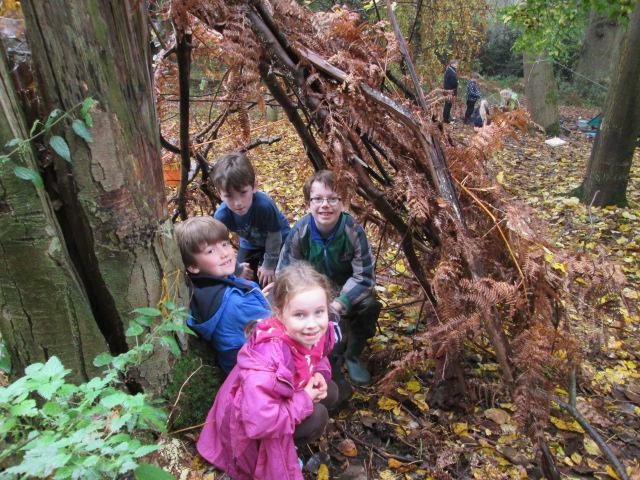 On Monday the class enjoyed their fifth Forest School session in the woods. 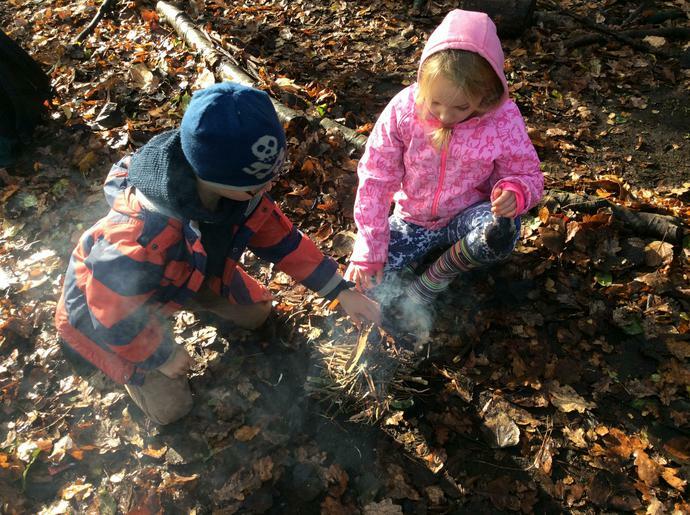 The children warmed themselves up in the bitter cold weather by building small fires from materials found on the forest floor. 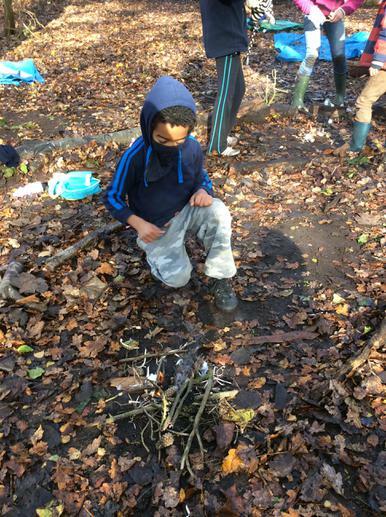 Everybody displayed great team work and supported one another when persevering to get each fire lit. 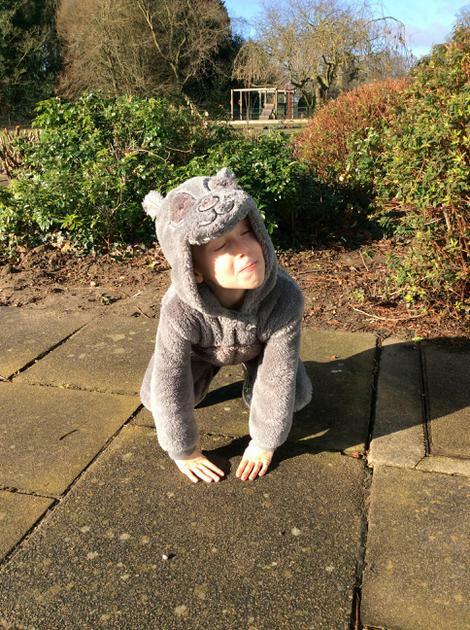 A chilly but fun morning was had by all. 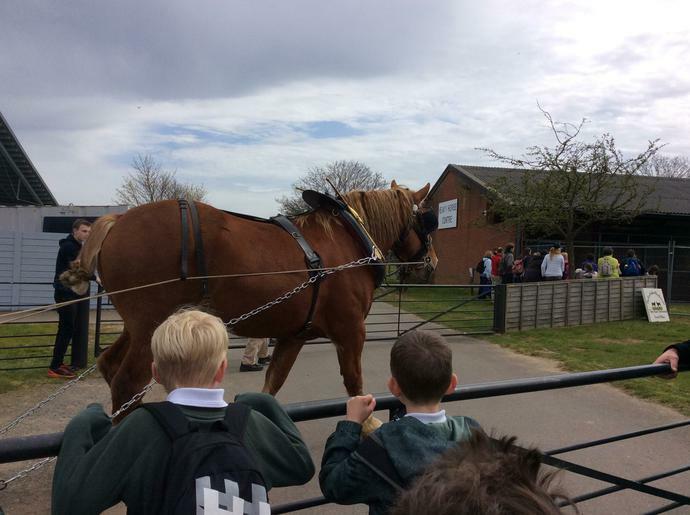 Yesterday Mrs Mitchell, Miss Hynard and I took 44 children to take part in the Big Sing event at the famous Snape Maltings Concert Hall. 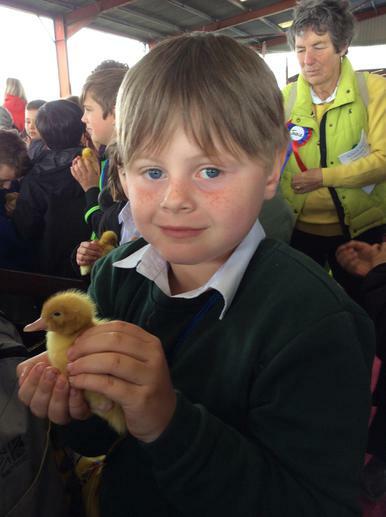 The children sung 8 songs composed especially for the event, alongside 18 other schools from across Suffolk. As an added surprise, we also got to see special guest Michael Morpurgo, who read a heart-warming poem he had written about his parents. 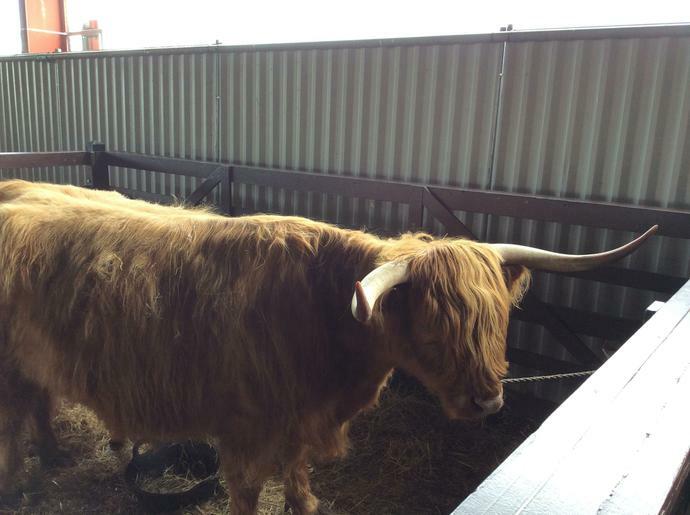 The event was a great success, and was recorded live! Click the link below to see us performing. 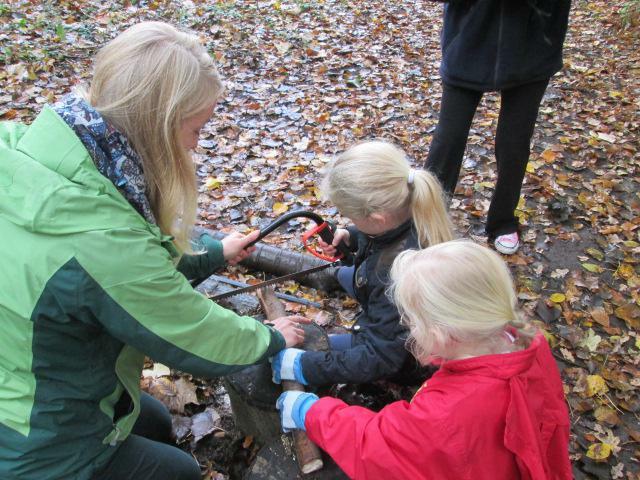 On Thursday Year 3 had their fourth forest school session with our lead, Lizzie the Ladybird. 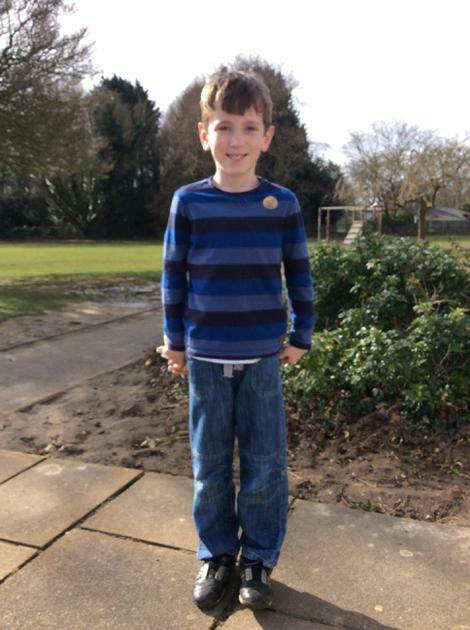 This week the children played some of their favourite games, including '1, 2, 3 Where are you? 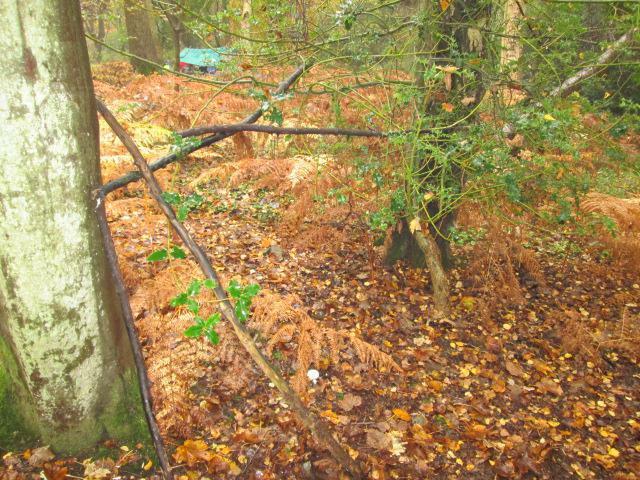 ', 'Camouflage' and 'Hiders and Seekers'. 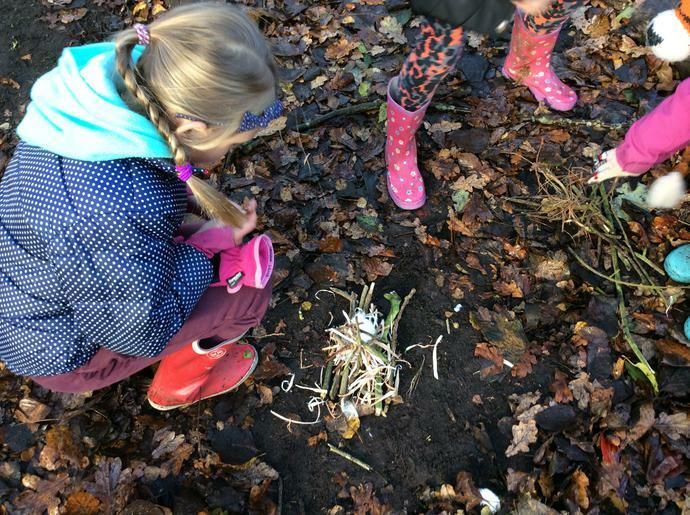 Alongside this, the children were also able to build and test their own water rafts out of natural materials found in the woods. 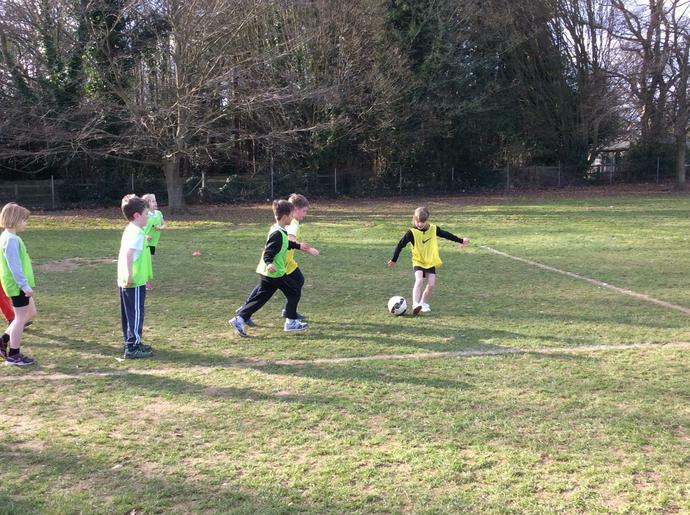 Despite the increasingly cold weather, a good session was had by all (especially when playing in the mud!). More photos of this session will be added next week. 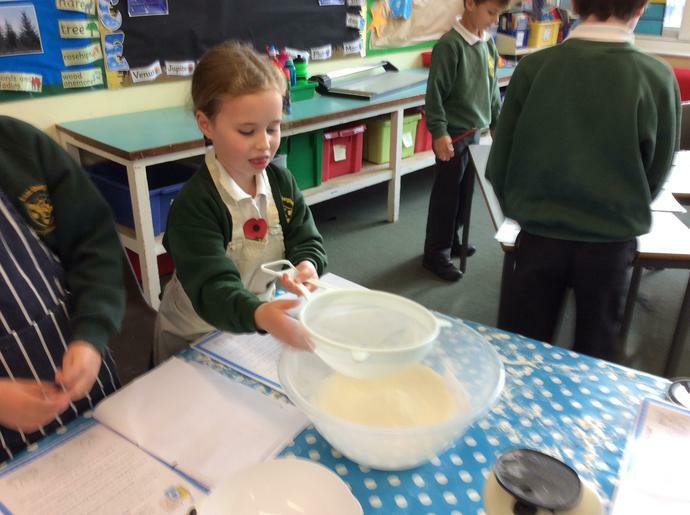 Year 3 have had an exciting morning designing, tasting and making different breads in Design Technology. 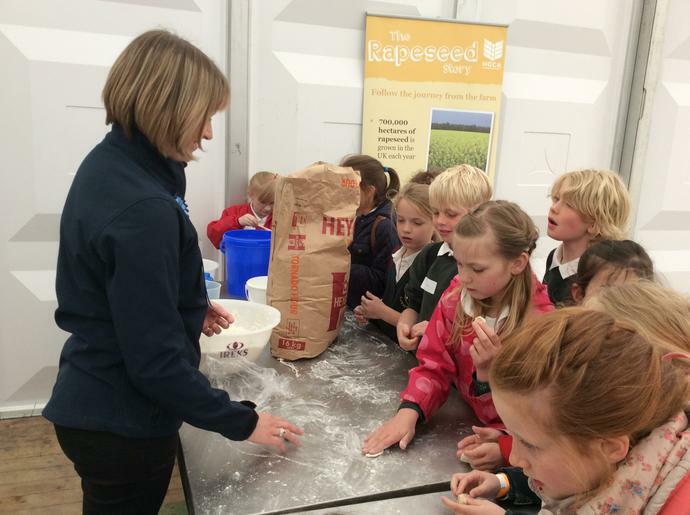 The children worked in groups of 4 and 5 to firstly decide how they were going to flavour and shape their bread. 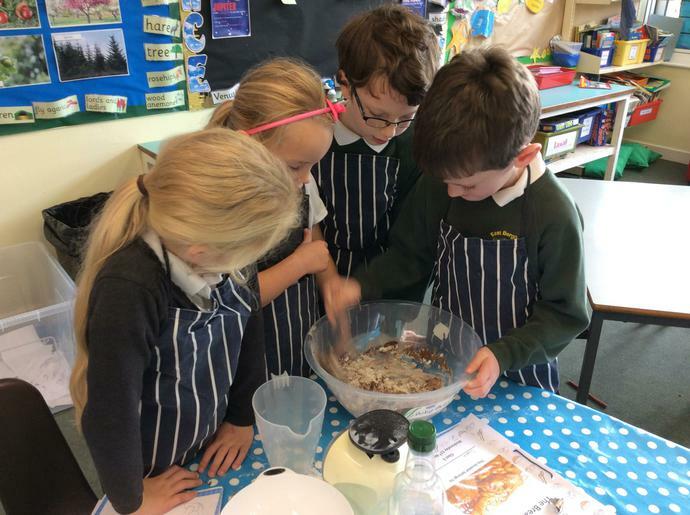 After careful consideration, each group followed a recipe to create their dough, adding their flavour of choice (cocoa powder proved popular!). 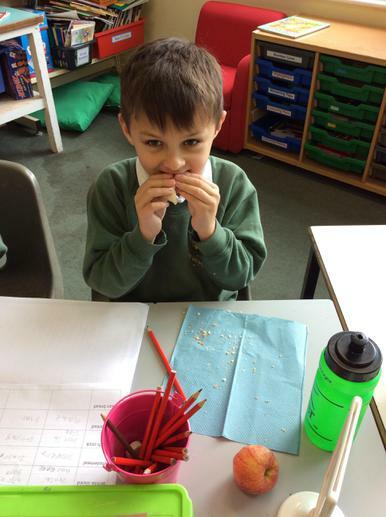 Whilst we left the bread to prove, we got to taste and evaluate different types of bread including naan, pitta, white sliced, wholemeal and french stick. 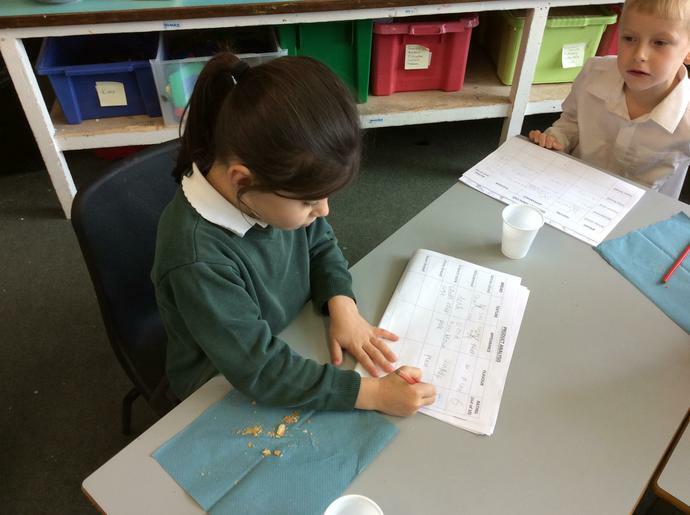 We commented on and discussed each ones texture, appearance and flavour. 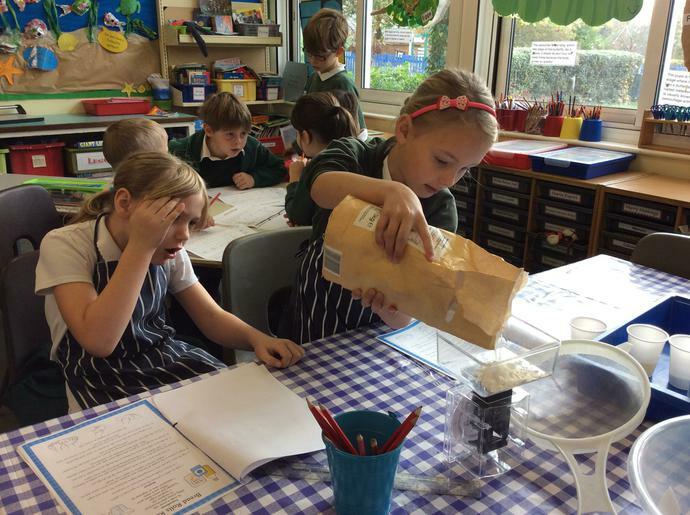 On Friday we will be using our D.T morning as a stimulus for writing a set of instructions on how to bake bread. 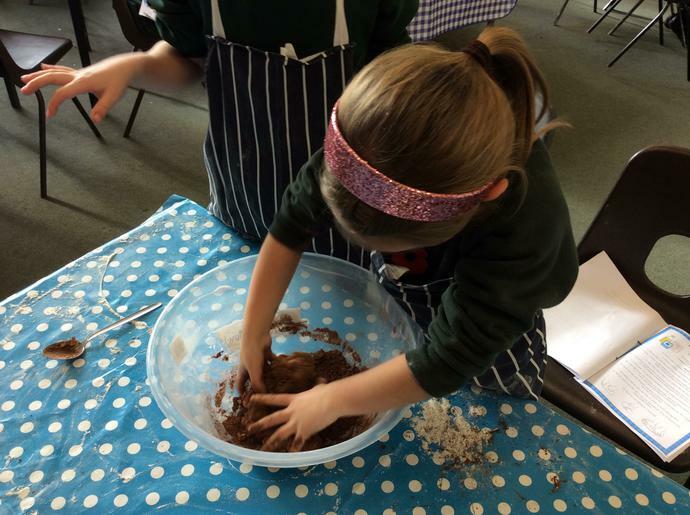 Have a look at the photos below to see us baking . 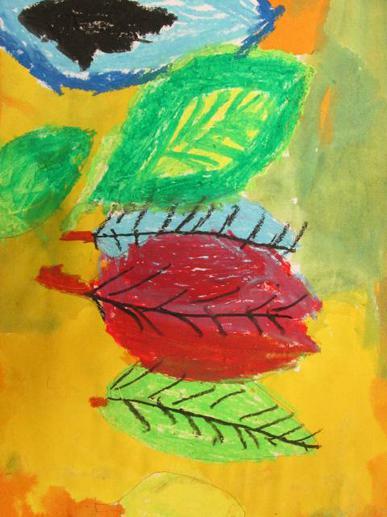 This afternoon we created art pieces inspired by our new topic, 'Our Natural World'. 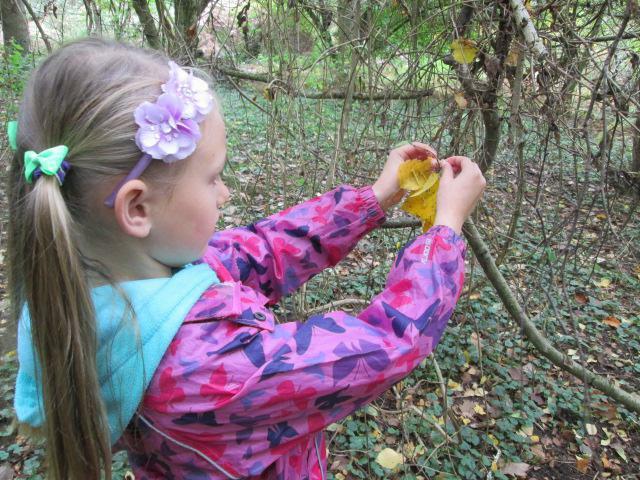 We each collected a leaf which we thought had an interesting shape, and used this as our starting point. 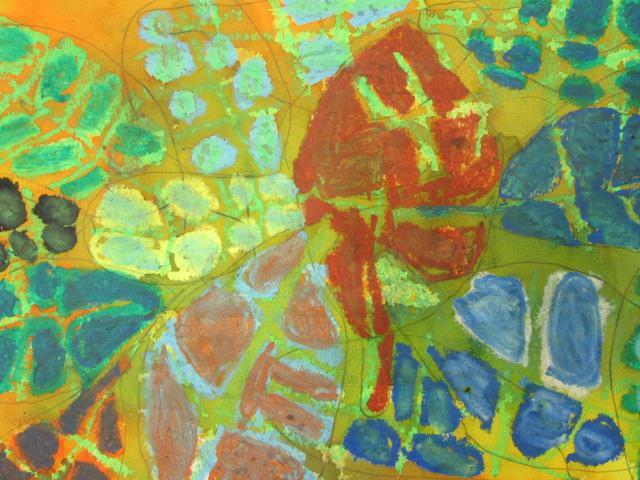 Next we drew around it several times in different positions on our piece of paper. 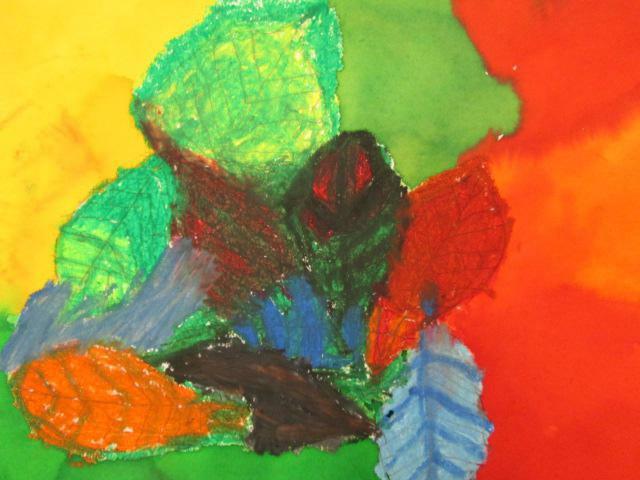 Afterwards, we coloured our leaves using an ombre effect with oil pastels. 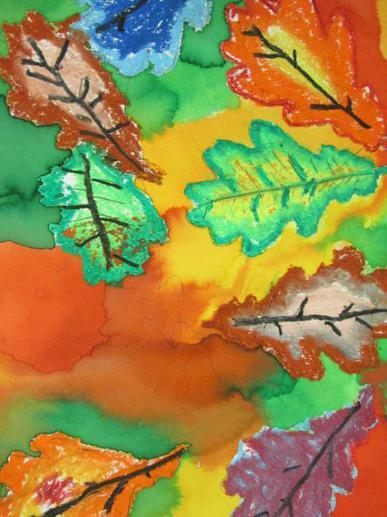 Finally, we used a brusho ink wash over the top to make an autumnal background. 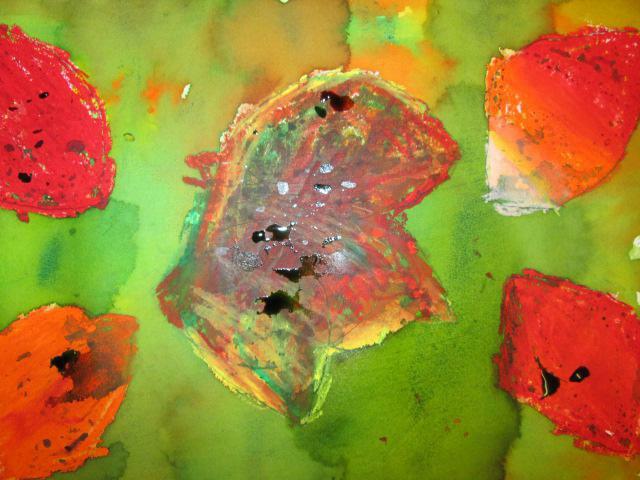 Have a look at some of our pieces below. 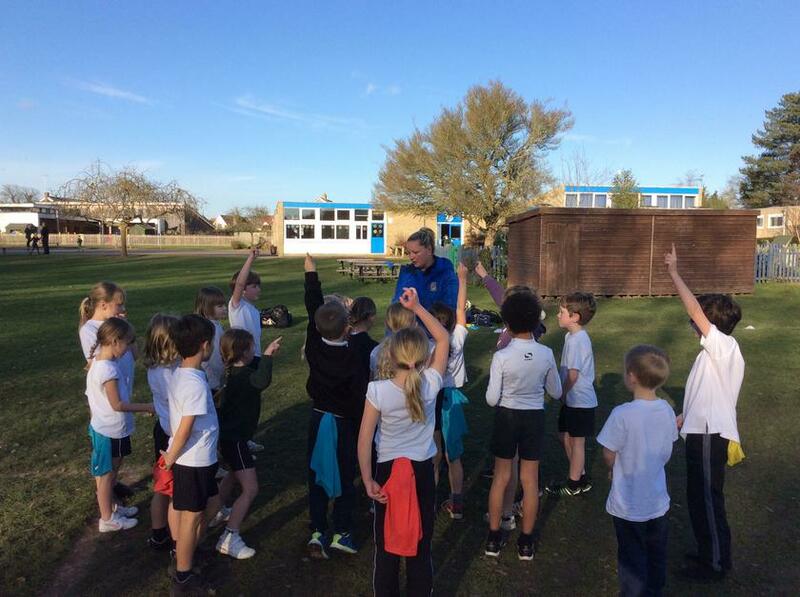 This morning Year 3 were lucky enough to have a football session led by a professional football coach from the Chelsea FC Foundation. 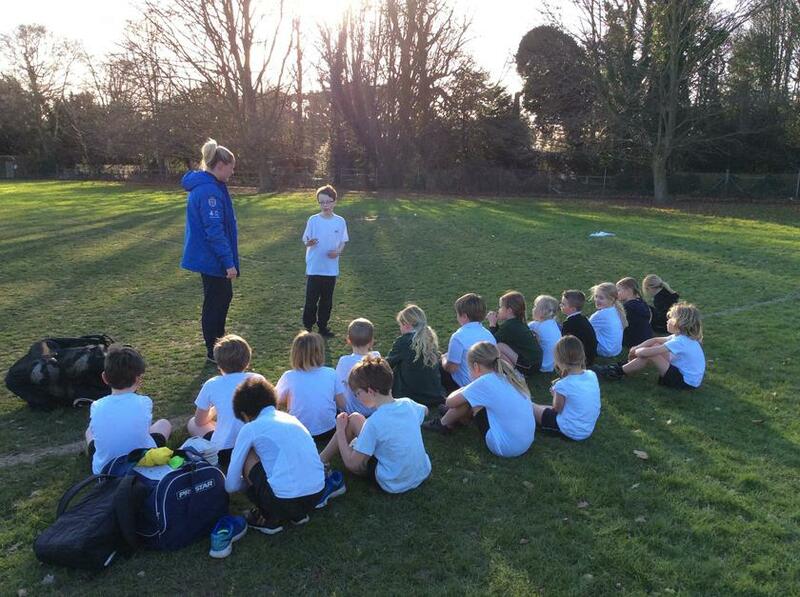 The Chelsea FC Foundation run weekly football sessions at East Bergholt High School, and information on these will be sent to parents in the next few days. 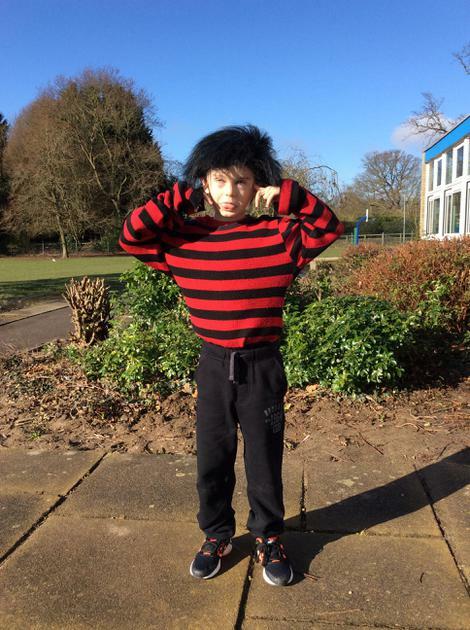 On Friday 20th November 11 children from Year 3 will be taking part in the Big Sing at Snape Maltings Concert Hall, along with 18 other local schools. 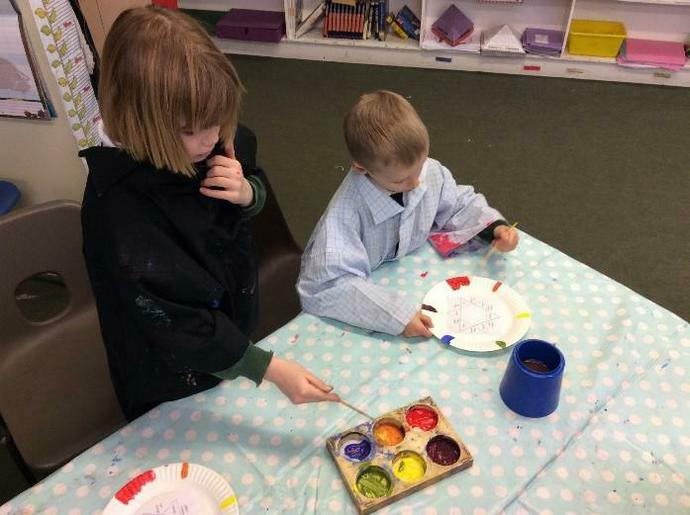 The children will be asked this week whether or not they would like to go, and the names of those who do will be picked out of a hat. Letters with all the information will be sent home at the end of the week. 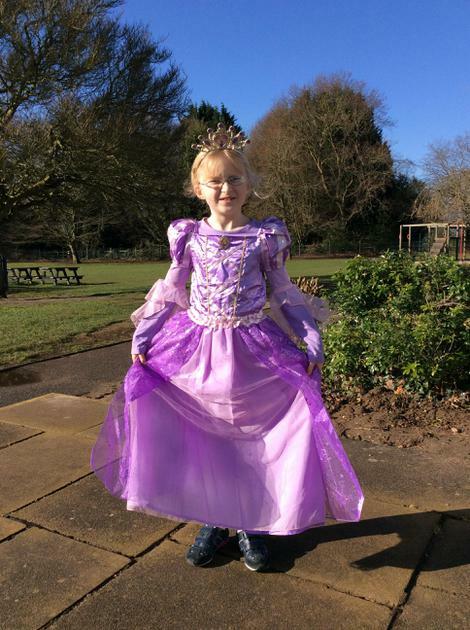 If you would like to practise the songs they will be singing at the event at home, please click the link below. 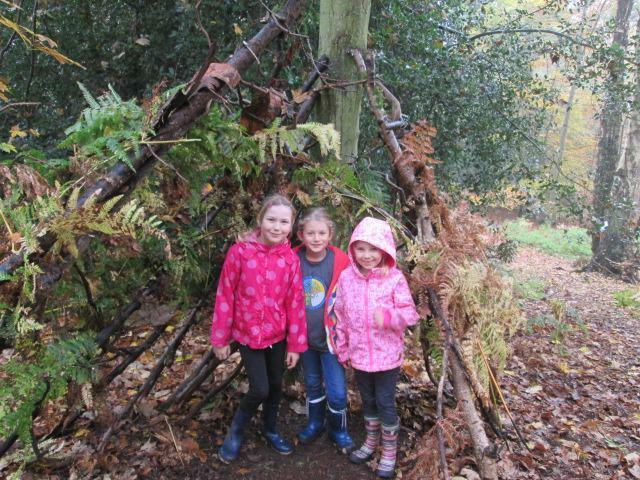 We have already had an adventurous start to the new half term. 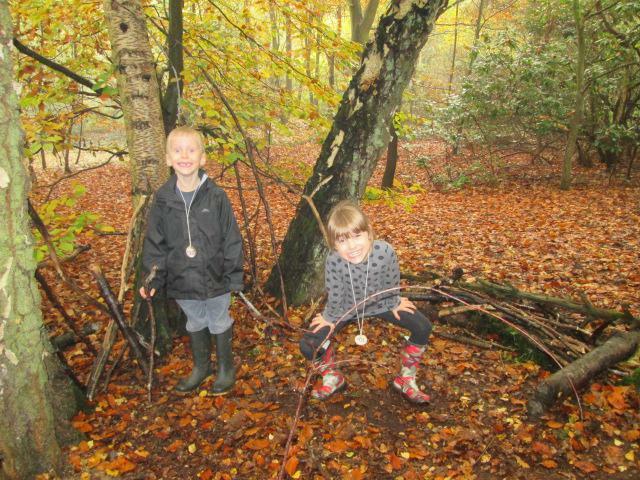 This morning Year 3 strolled down to the misty woods to take part in various activites using natural materials around us. 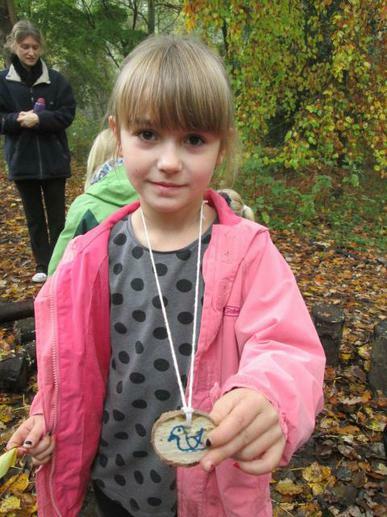 We especially enjoyed getting our hands dirty building dens and making our own name badges! 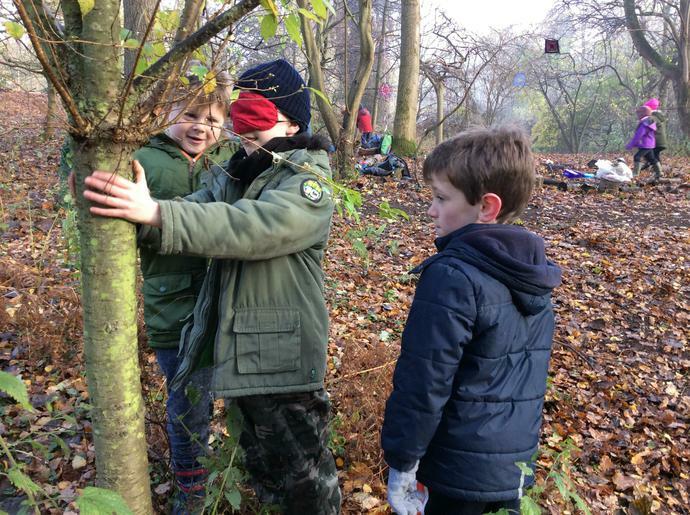 Our forest school sessions fit perfectly with our new topic for this half term, 'The Natural World'. 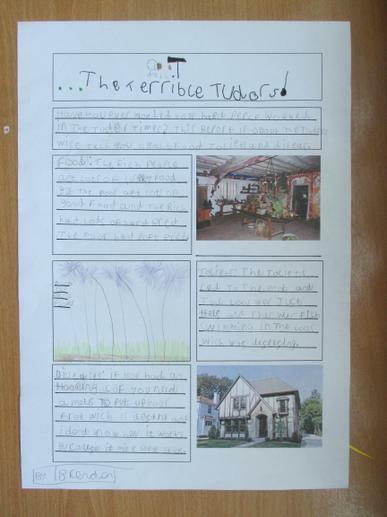 Over the next few weeks we will be using these sessions as a stimulus for our writing in English. 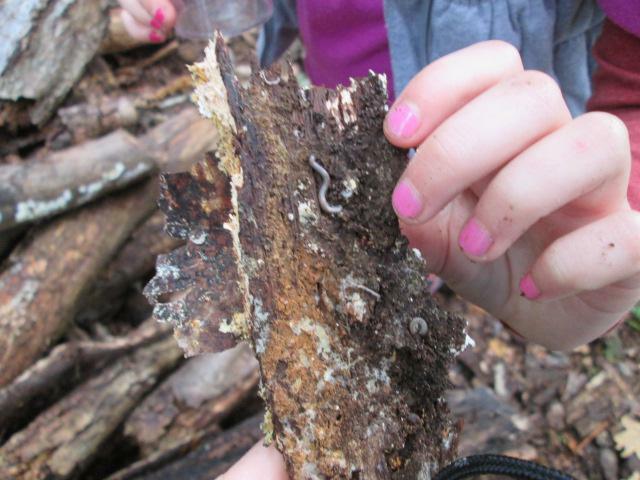 Keep checking the class page to stay updated on our learning in class . 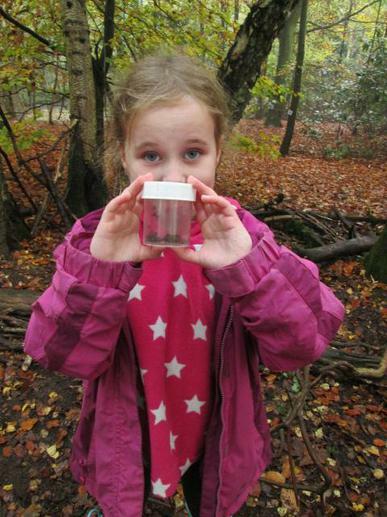 Today the children had their second session with Lizzie the Ladybird at Wake-Walker Woods. 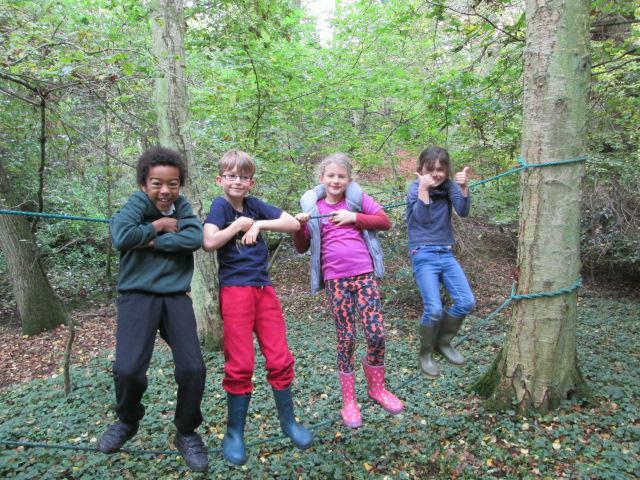 The children had the opportunity to choose from a range of different activities, from low ropes to crown making, minibeast hunting to threading bracelets. 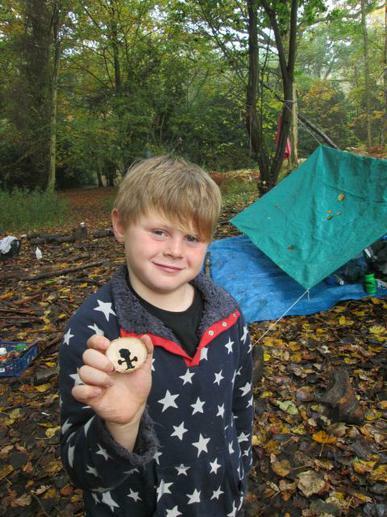 Thank you to all the parent helpers who have joined us over the past two sessions, without you these sessions simply wouldn't happen . 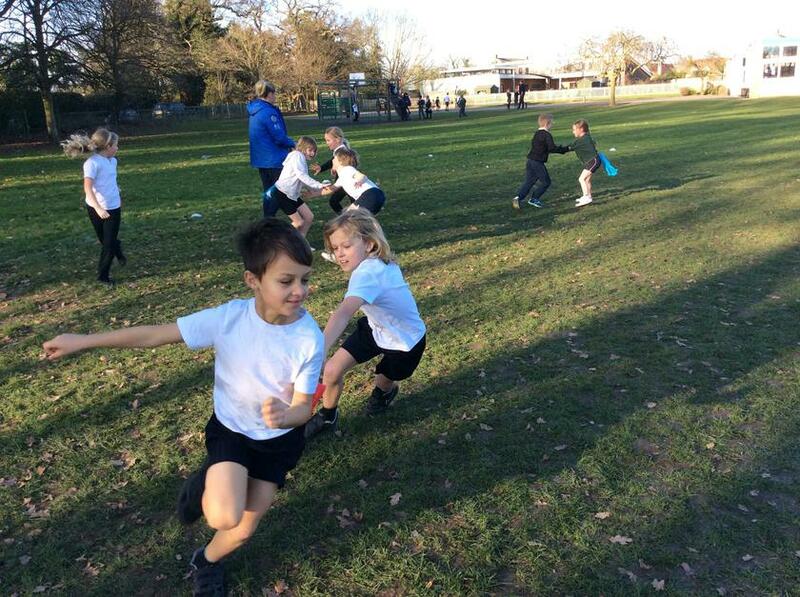 Have a look at the photos below to see the children in action. 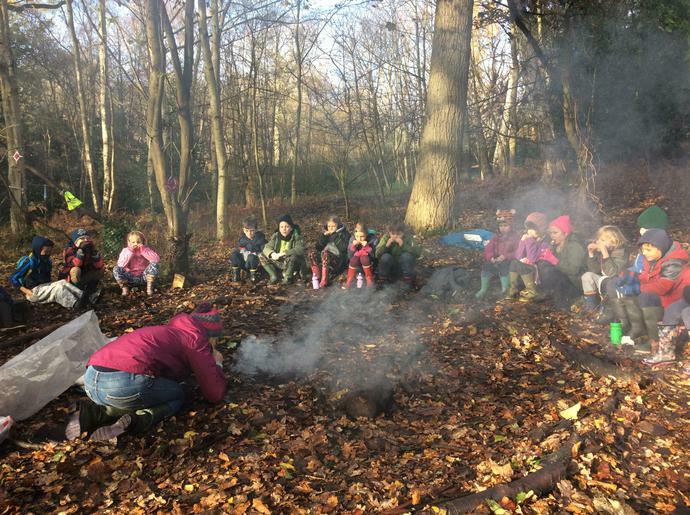 This morning Year 3 took part in their first Forest School session in Wake-Walkers Wood. 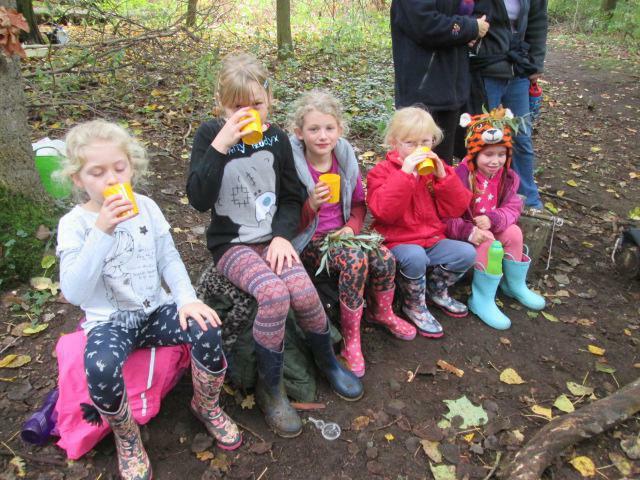 Lizzie (our lead) helped us to decide what our agreements would be (to help keep us safe), organised a game of hide and seek, taught us the centipede game and even gave us all a hot chocolate! 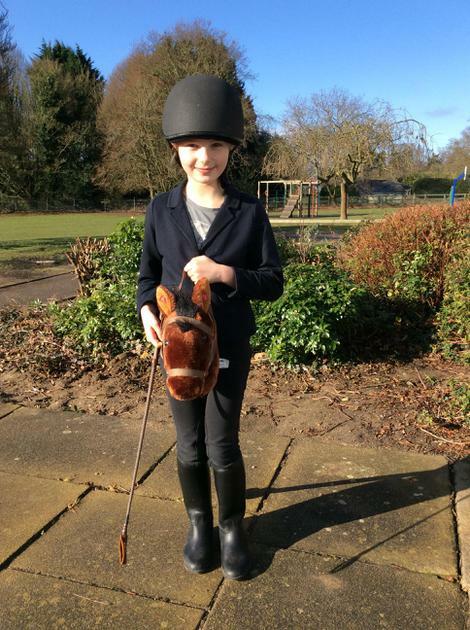 It was great to be outside on such a beautiful morning, thank you Lizzie for a really enjoyable first session. 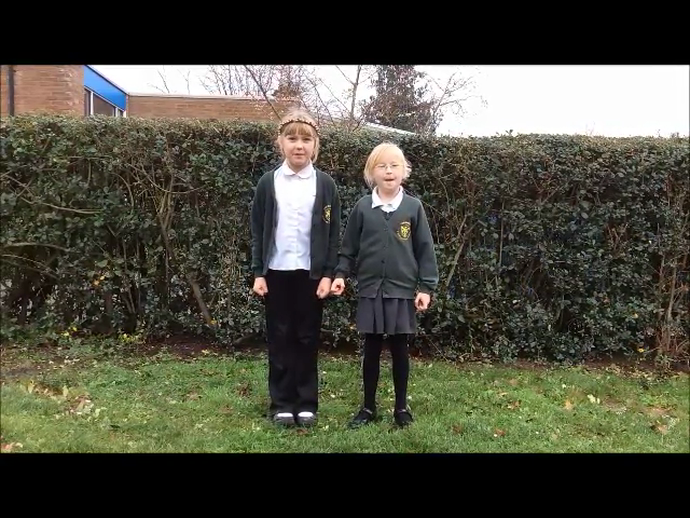 Continuing with our poetry theme, the children were challenged to use two instruments to improve a performance of the poem Raspberry, Strawberry, Gooseberry, Plum by Jack Ousbey. 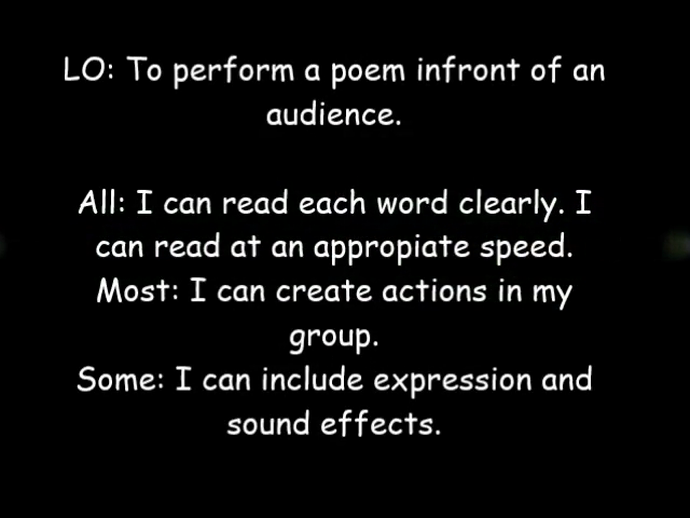 They were challenged to use rhythm, clear speech and good speed to keep the audience inticed. Here are some examples below. Lilia, Estelle, Charlie and Harry. 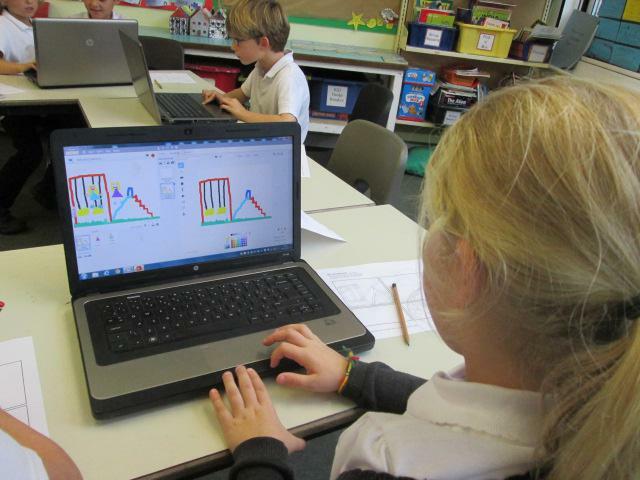 This morning Year 3 were investigating right angles around the classroom. 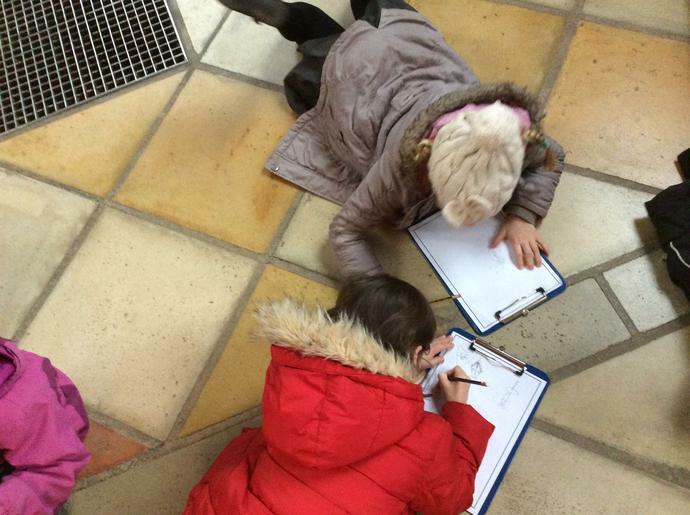 We were using the 'Right Angle Monster' to help us decide what objects had right angles. 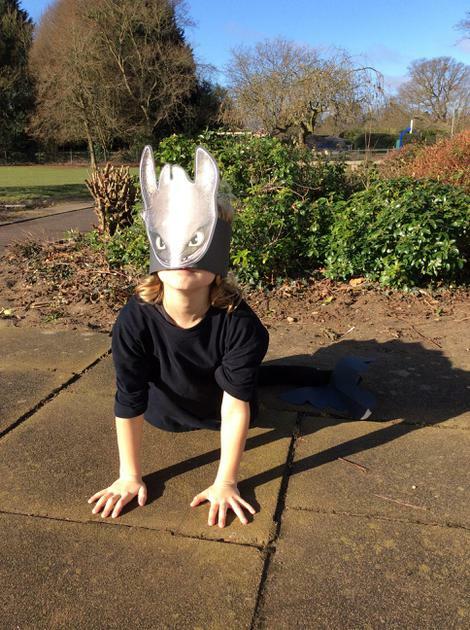 This helped us to create a menu full of tasty right angles for the monster to eat! 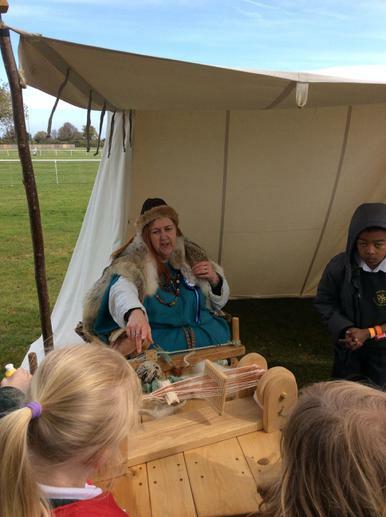 Next Wednesday Year 3 will be singing a song about the wives of Henry VIII in their first class assembly. Click the link below to watch the video we have been using in class to help us learn the lyrics. 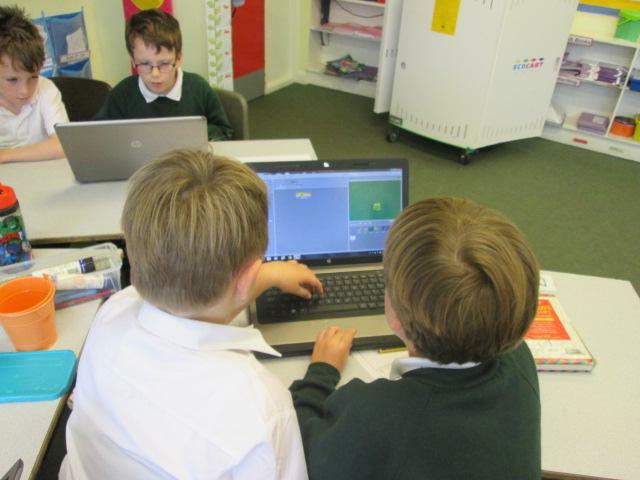 This afternoon Year 3 continued with their current Scratch projects. 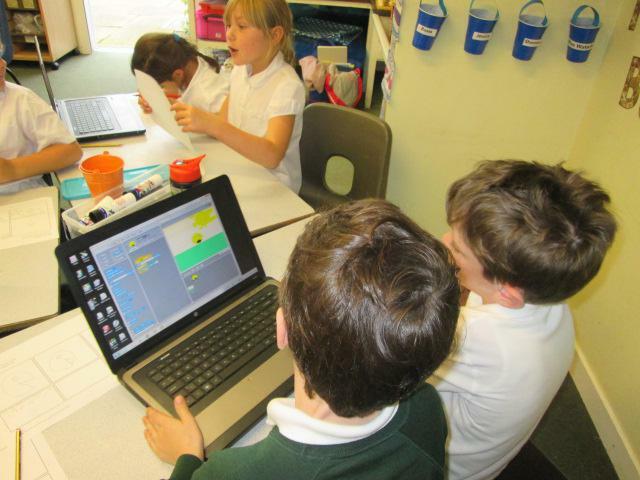 Scratch is a free program which simplifies coding, making this essential modern skill accessible for children. 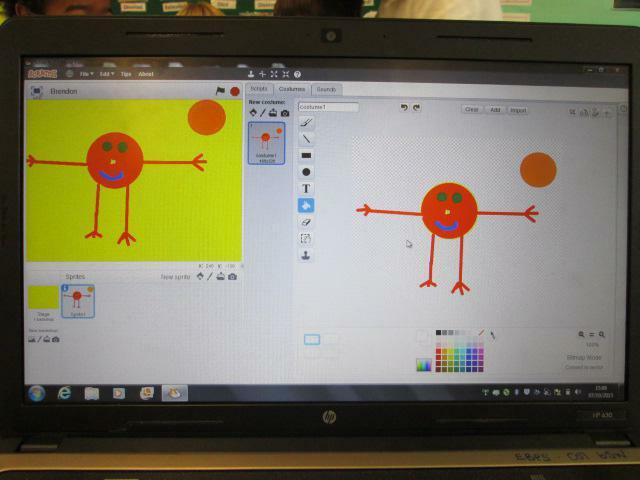 We are currently learning how to animate, and have so far created our own backdrop, character (sprite) and storyboard. 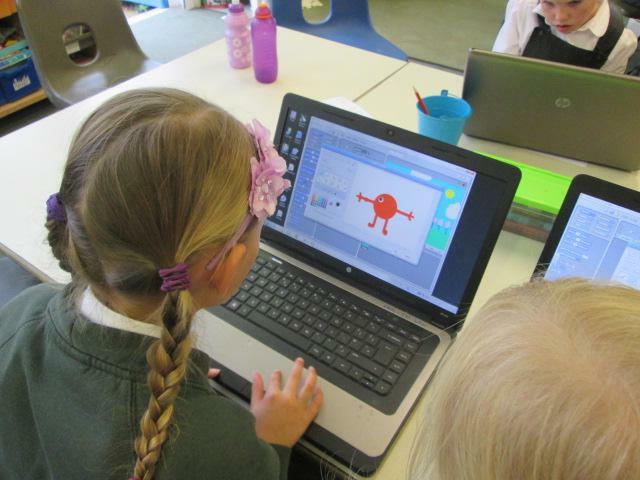 Today we have used a 'trial and error' approach to work out how to make our animation ideas come to life within Scratch. 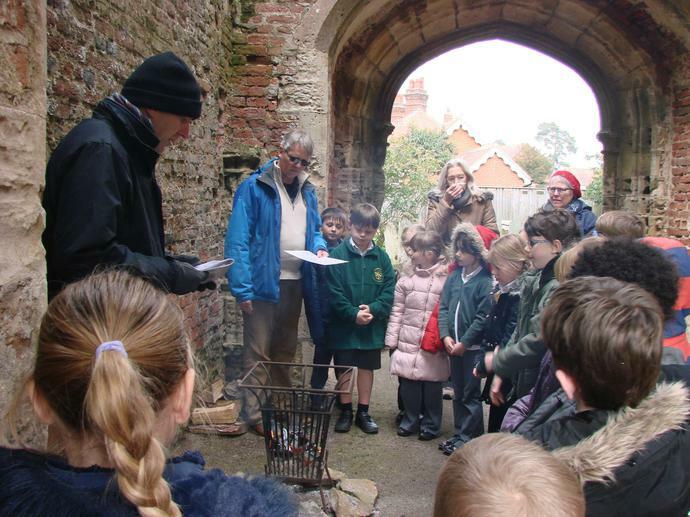 This afternoon Year 3 walked to St. Mary's Church to experience many creative activities exploring the Harvest Festival. Thank you to Rev. Steph, Rev. Matthew and everyone else who was involved in what proved to be an educational and fun afternoon. 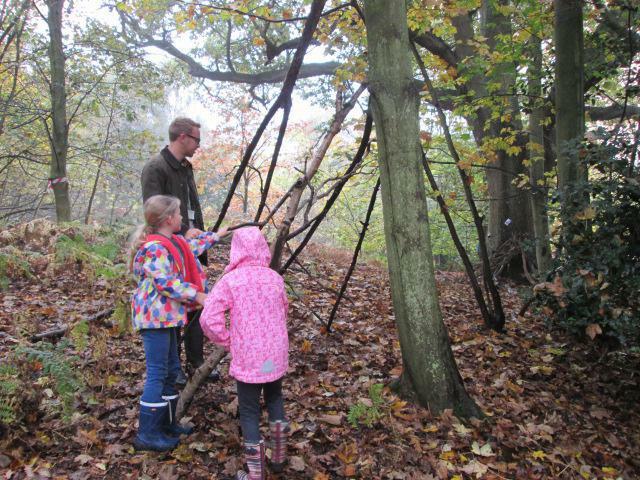 Year 3 will be taking part in six Forest School sessions during the next few weeks. Please click the link below for more information. Today we moved onto our new text type, poetry. 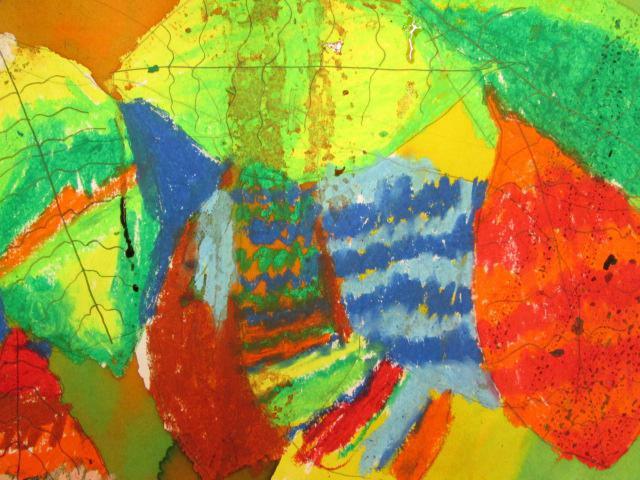 We worked in groups of 4 to rehearse and practise a performance of the poem 'The Bug Chant' by Tony Mitton. 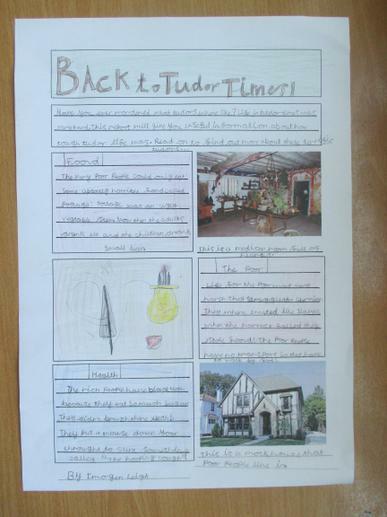 Since our trip to Kentwell Hall, Year 3 have been beavering away researching and planning reports about Tudor life. 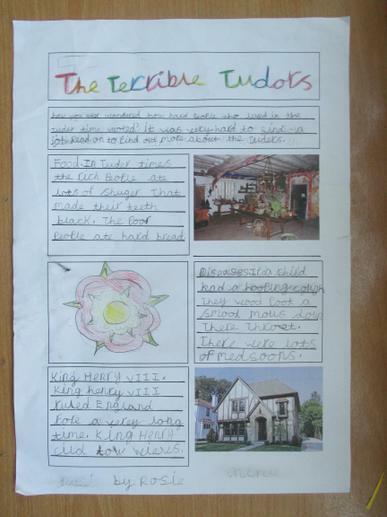 Each child has created their own heading, written a clear introduction, chosen three sub-headings and has included lots of factual information. Here are a few examples below. 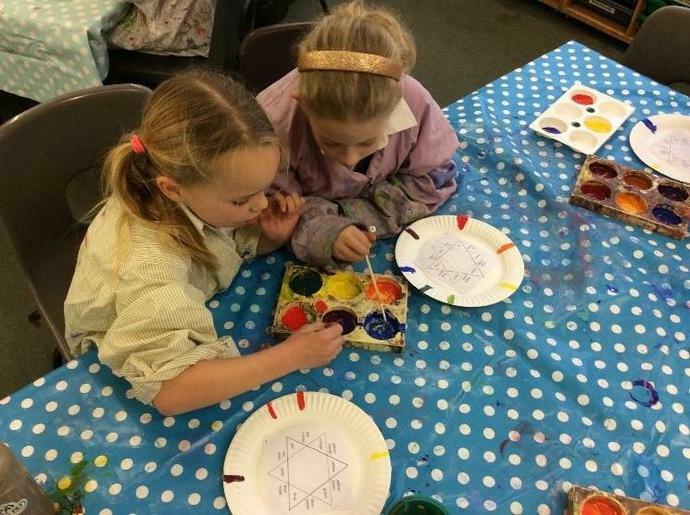 The children have made a fantastic start to Key Stage 2, and have already been very busy across all areas of the curriculum. 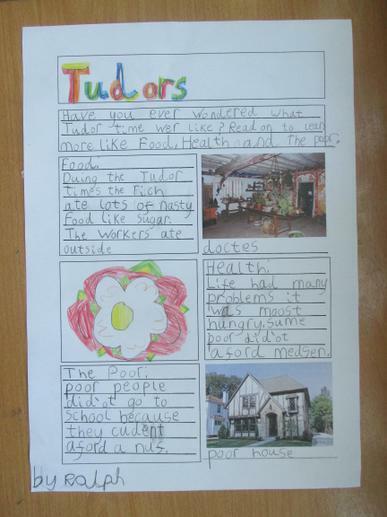 The class have really got stuck into this terms topic, ‘The Terrible Tudors’. 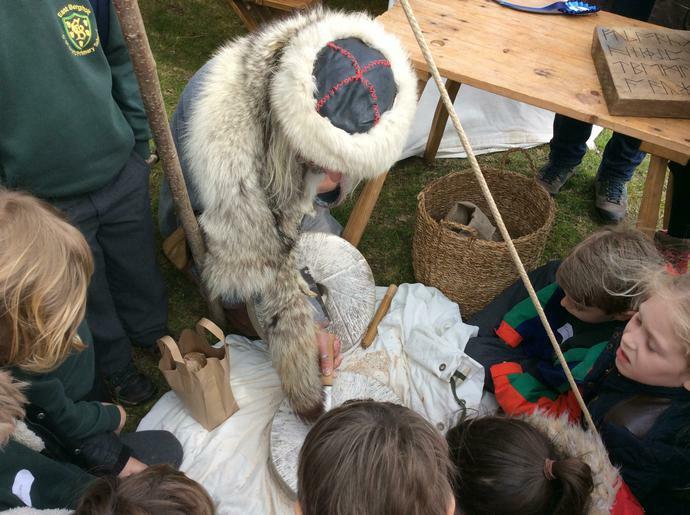 To help the children understand what life was like for those who lived in Tudor England, Year 3 and 4 ventured to Kentwell Hall to experience a day as a Tudor child. 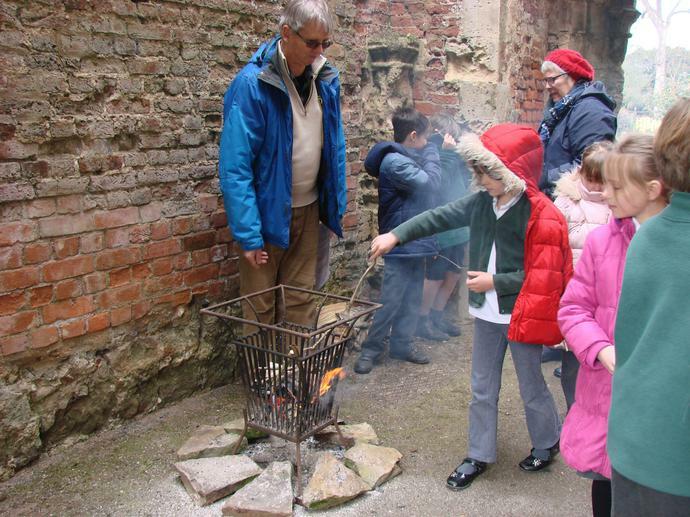 Despite the rain, they got to fully immerse themselves in all aspects of Tudor life, from herbal medicines to cooking methods, musical instruments to magic tricks! 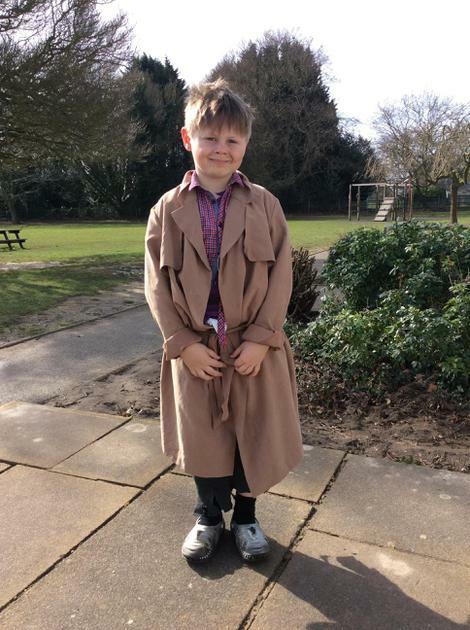 In English, we managed to take advantage of the September sun to improvise the narrative of the quirky Roald Dahl tale, ‘The Enormous Crocodile’. 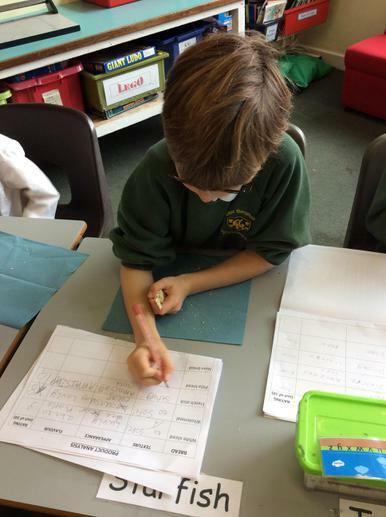 Doing this helped us to understand the importance of a clear plot when writing our own stories. 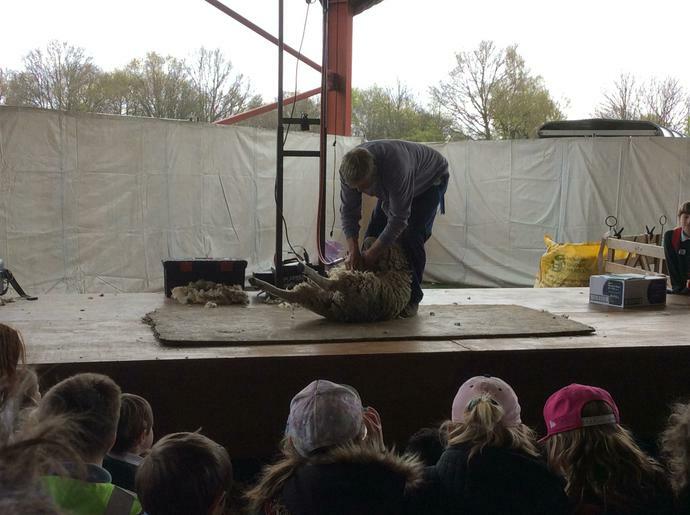 The performances were delivered beautifully, and were very entertaining to watch too! 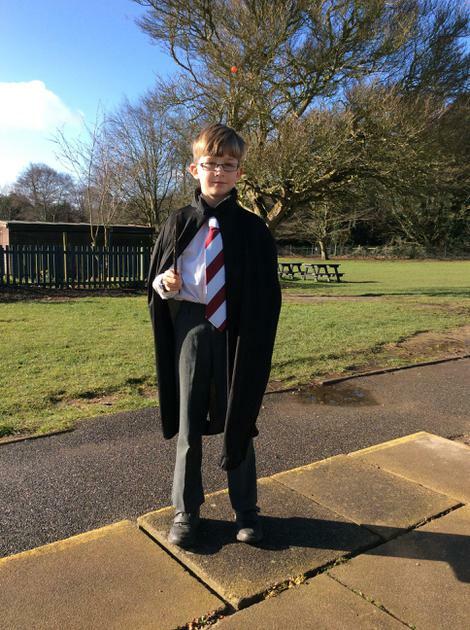 Finally, our Science topic this half term is ‘Forces’. 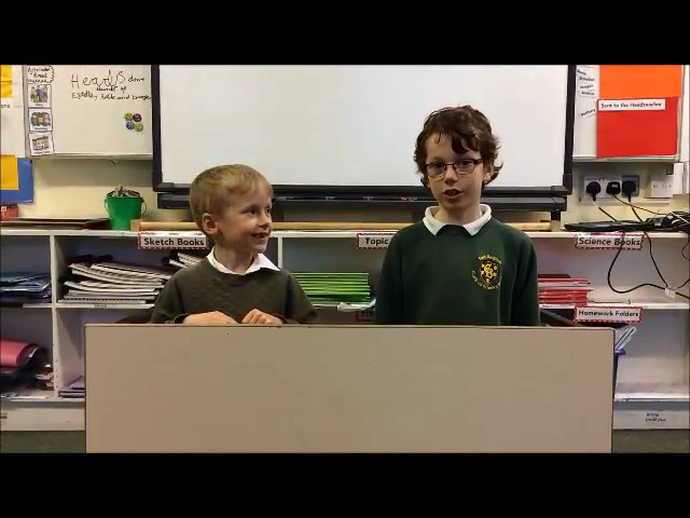 We have already learnt that all forces are primarily either ‘push’ or ‘pull’, and that friction is a force which acts between two surfaces rubbing together. 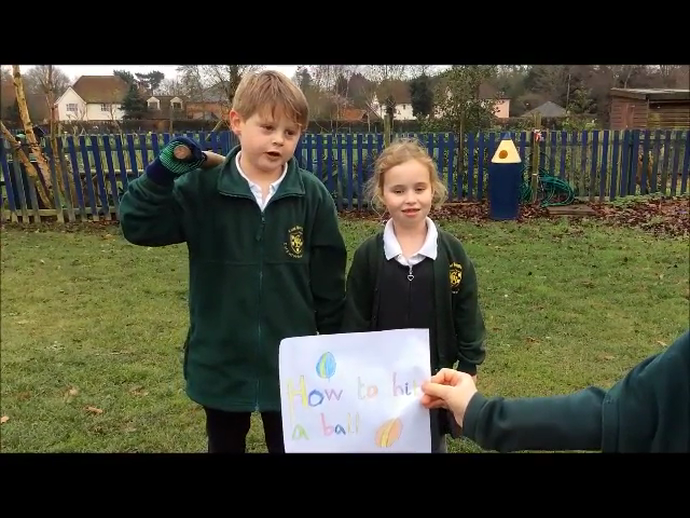 This week, we have been learning about the force air resistance. 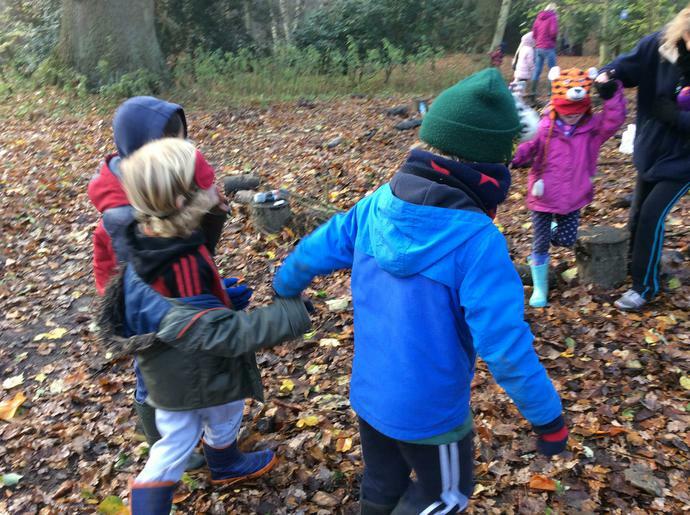 After a long discussion, the children decided that certain shapes created more air resistance than others when falling through the air. 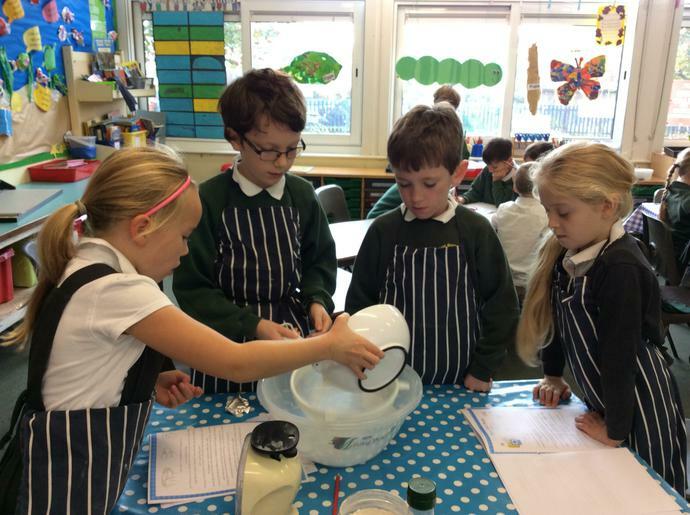 The class were then given some basic materials to help them create an air resistance capsule for their very own egg astronauts! 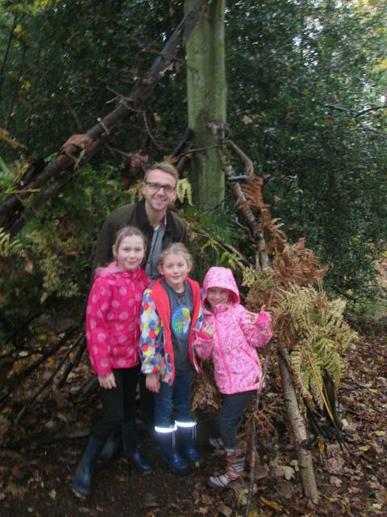 After testing, I am happy to reveal that all four of our astronauts survived a mighty two metre drop! 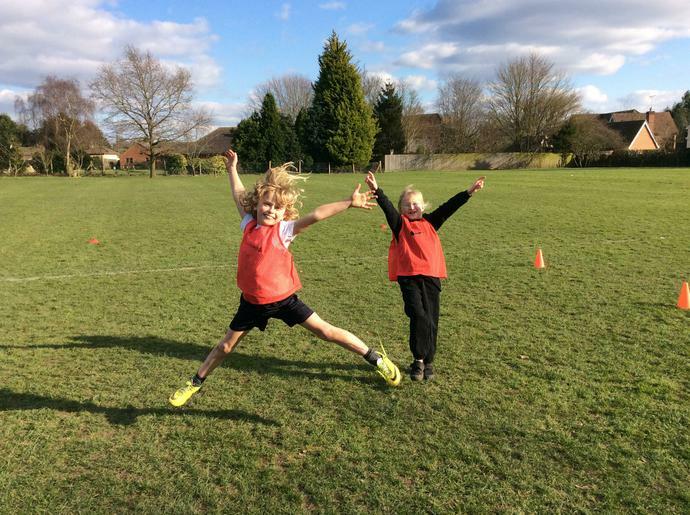 A fantastic way to end our third week of term.